ADOPTED-JESSICA AND JUSTIN B/W AND WHITE HAVANESE PUPPY BOY AND PUPPY GIRL! 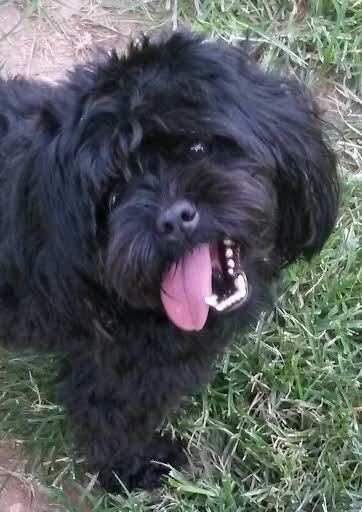 ADOPTED-WILLIE WONKA-BLACK SHIH POO PUPPY BOY! 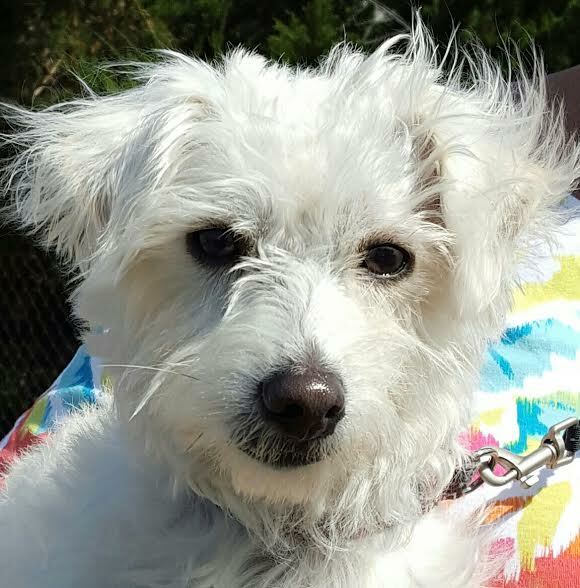 ADOPTED-KRICKET – WHITE POODLE MIX PUPPY GIRL! 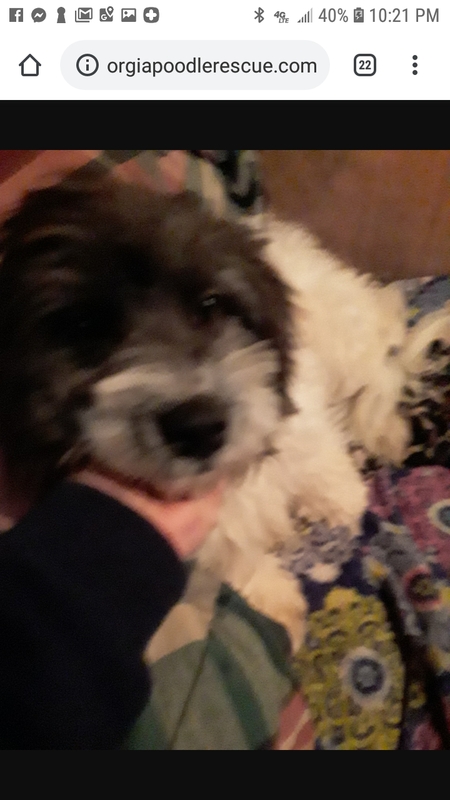 ADOPTED!-HERSHEL-SILVER/WHITE SHIH TZU OR SHIH POO BOY! 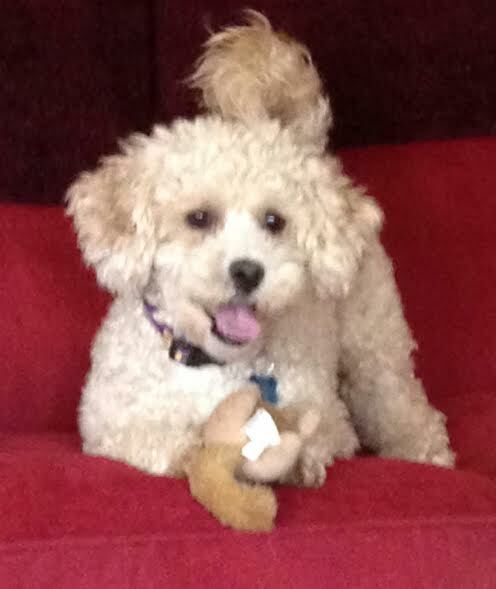 ADOPTED-OZZIE-APRICOT TOY POODLE MIX BOY! 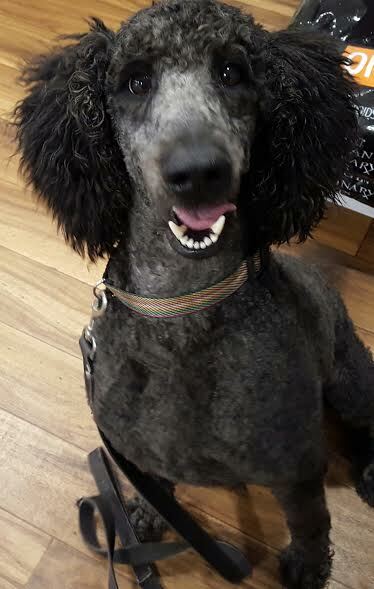 ADOPTED-BARBIE-B/W PARTI STANDARD POODLE GIRL! 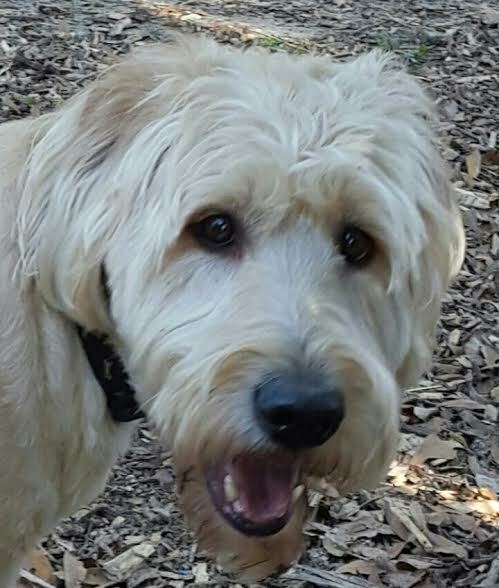 ADOPTED-CHARLIE-CAFE AU LAIT LABRADOODLE BOY! 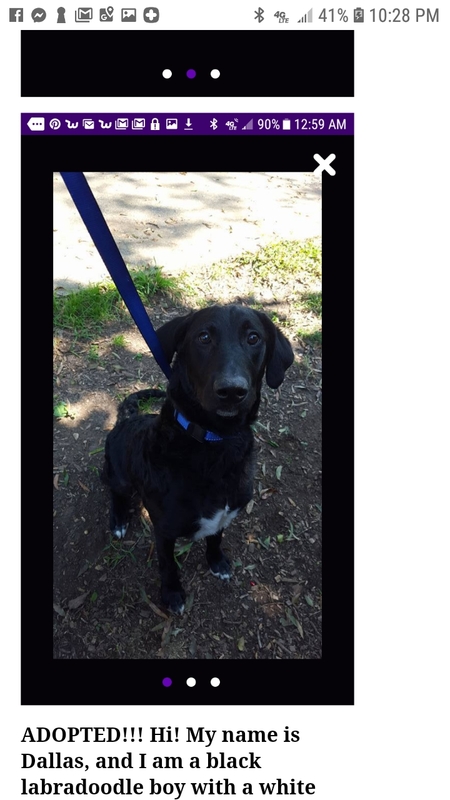 ADOPTED!-DALLAS-BLACK LABRADO9DLE BOY WITH WHITE TOES AND TAIL TIP! 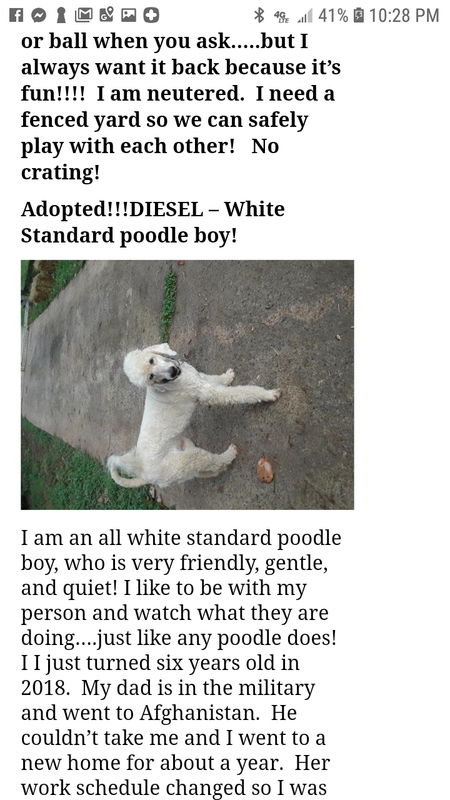 ADOPTED!-DIESEL, WHITE STANDARD POODLE BOY! Adopted!! 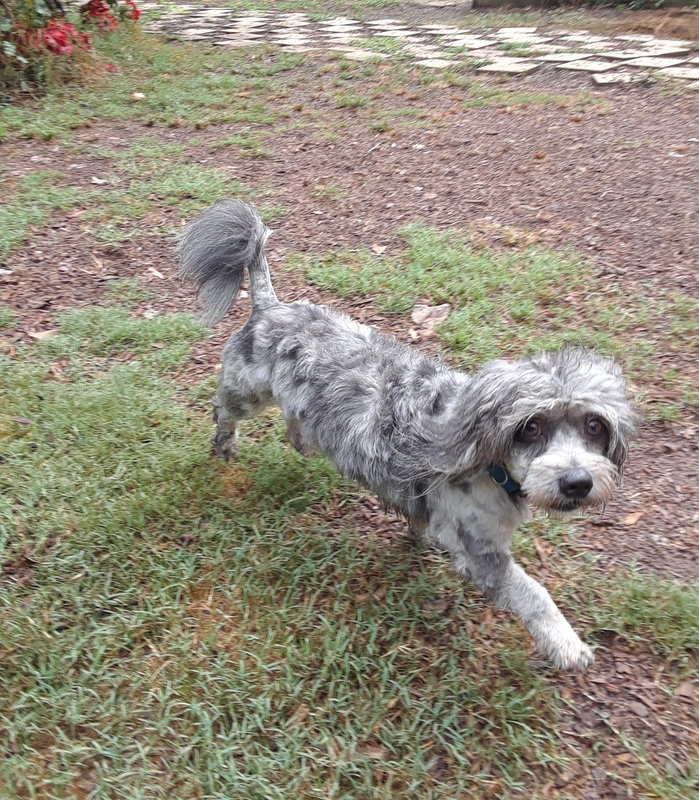 !-BUSTER – Two-Tone Silver/Blue Poodle/Yorkie Mix Boy! Adopted!-ELLIE -White Toy Maltese Girl! Adopted!! 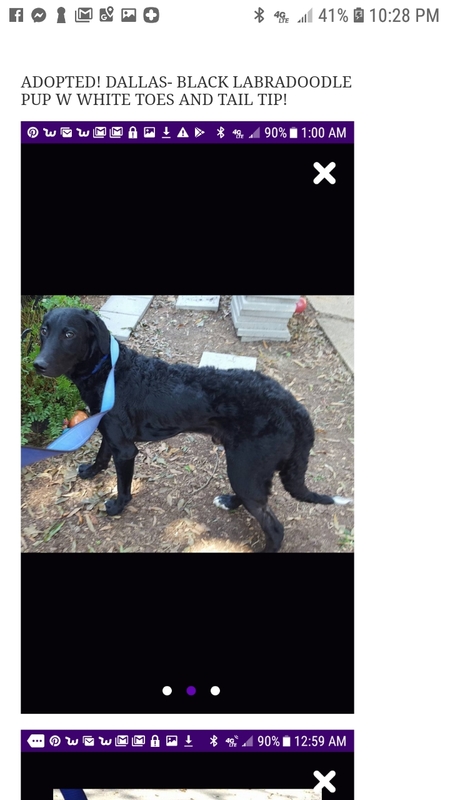 !-DALLAS – Black with white points Labradoodle Boy! 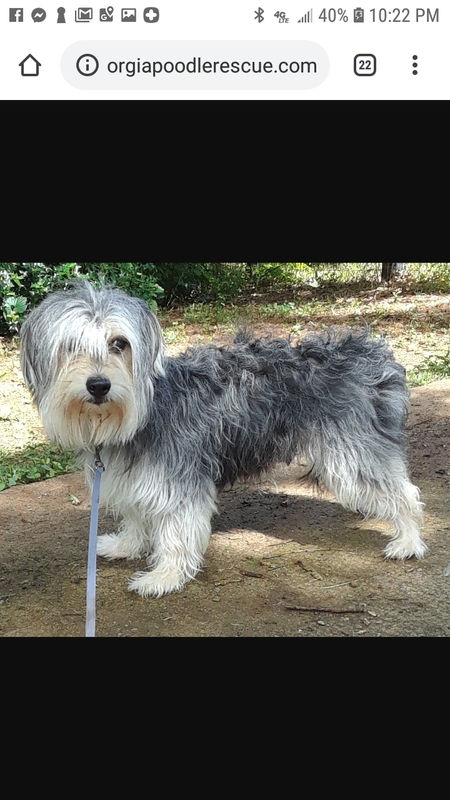 Henry is a a rare colored blue merle havanese. We neutered, vaccinated, dewormed and heartworm tested him negative. He is such a joy with other dogs and with people. He is a wonderful, cheerful personality. 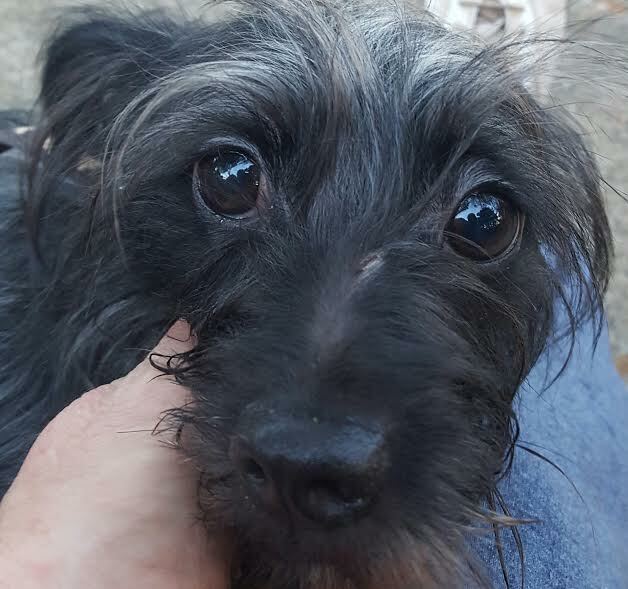 He is about one year old per our vet, is potty trained, loves other small, friendly dogs and is a very nice boy. He walks on the leash well and knows the come and sit commands. He was a little nervous with us following him around with a camera in his face but he really does smile alot! 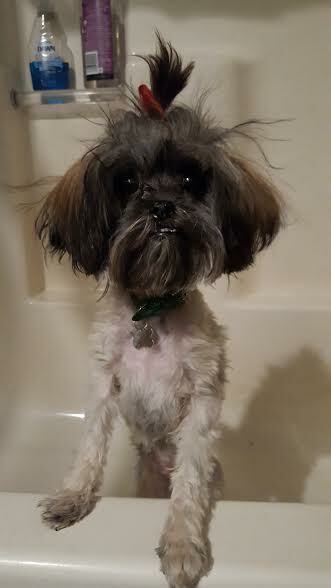 He has long hair that was clipped short as he came to us matted…..but is beautiful now! Look at the beautiful blue merle design all over him! He is a real gem! No crating! KLUSKA- Black and Silver German Shepherd Girl! BELLA-Adopted!!!-Adopted!! !-Silver or Blue Labradoodle Girl! 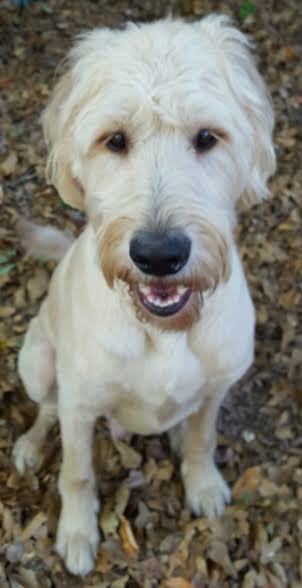 Ollie is a 2 year old Standard, born April 16, 2016. 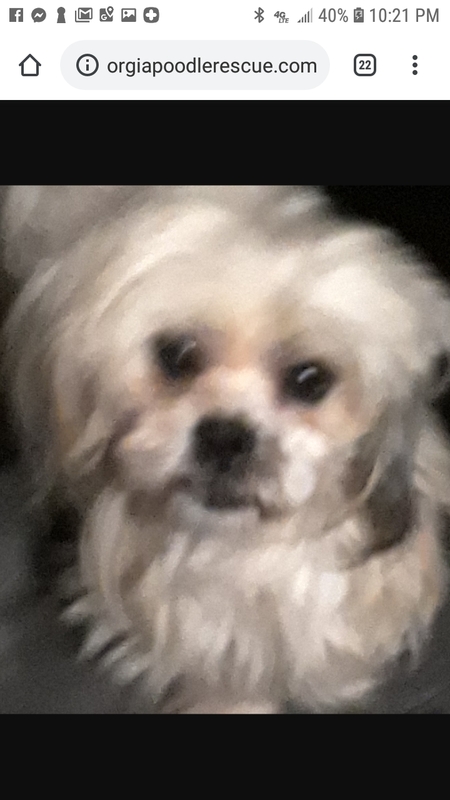 He’s cream, about 60-65 pounds, male, neutered, with clear eyes, with no missing teeth with light tartar, non aggressive, no history of of attacks or aggression, agreeable to people and animals, originally purchased from a breeder. The former owner got him at about 10 weeks. He was the largest of his litter, he’s slim but healthy and solid. He’s about 26” from the floor to his shoulders, housetrained, and stays near you outdoors, comes when called, knows basic commands of sit and handshake. 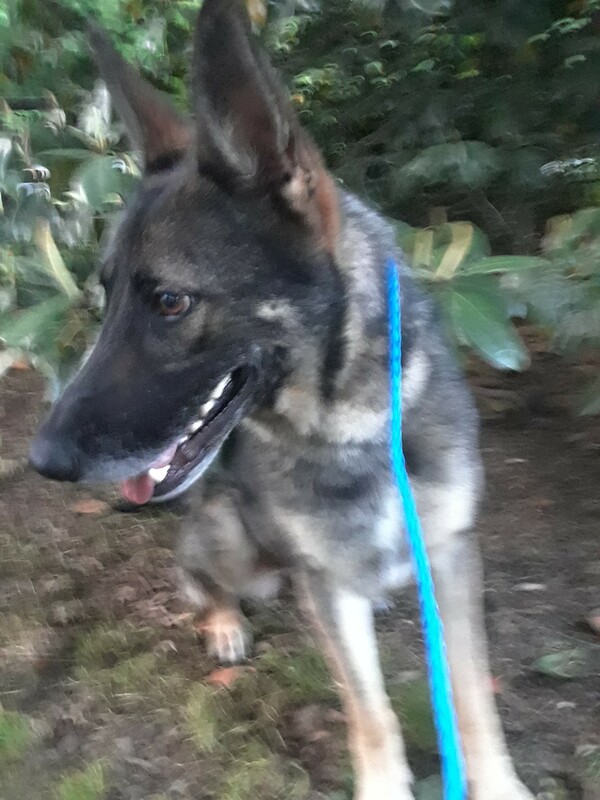 He was surrendered due to a change in his former owner’s relationship and professional/living circumstances prevented them from keeping him in a home where he can receive attention and exercise he needs. This is one nice dog No crating! Hi! My name is Annie! 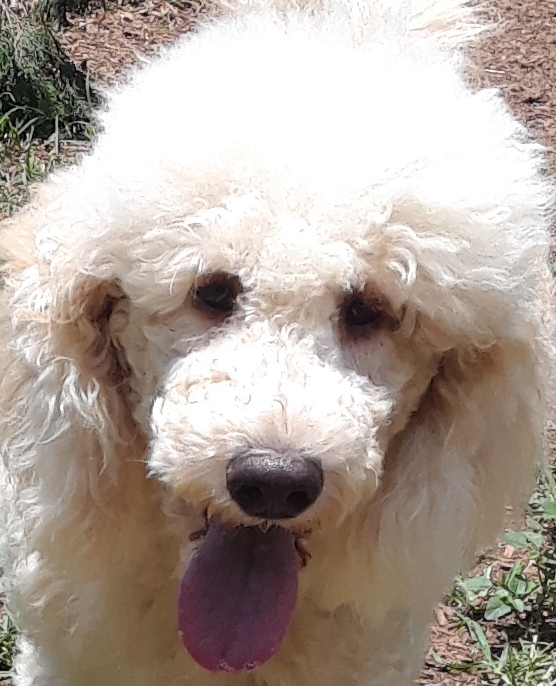 I am a 1.5 year old cream with apricot ears moyen size goldendoodle girl! I weigh 41.5 lbs. 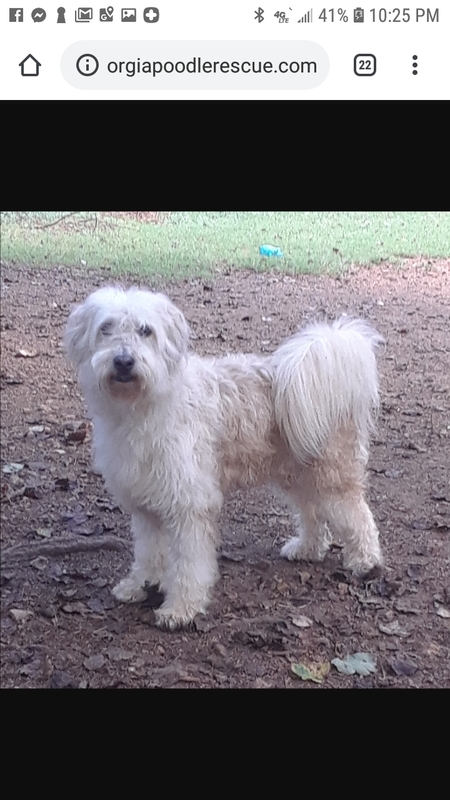 My owner died and I am looking for a home with the same or similar kind and size dog. I am friendly, love attention, am happy, like other friendly dogs and like to play, run, and be pampered. I am learning my commands. $600 No crating! 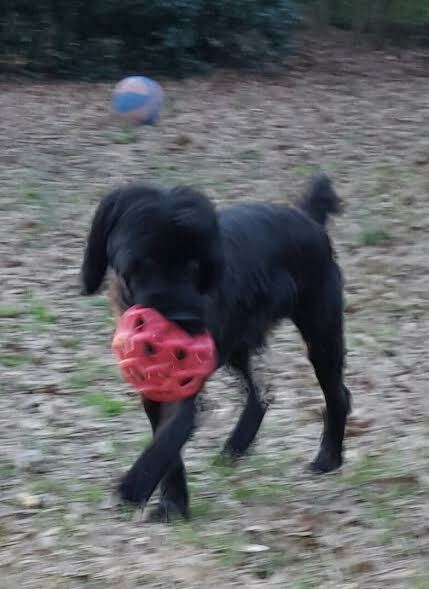 We have a 4 month old jet black standard poodle puppy boy named Kiwi who came from a breeder (confidential). Kiwi was just neutered and update on his vaccines. He just.came to us! Kiwi has some scarring on his muzzle due to puppy strangles when he was very young. The vet totally eradicated it and then Kiwi came to us several weeks later. He is a healthy dog now! 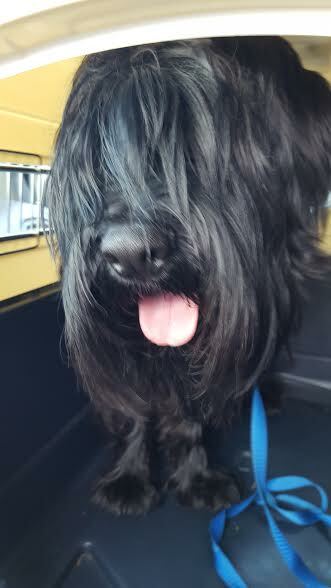 Here are a few pix of him in the van. He is potty trained well for a puppy boy but you must do your part in taking him out often until he adjusts to your schedule. He is lively, fun, happy and full of energy! He is smart! He smiles a lot and loves to play. You must have the time and energy for a puppy! KIWI-Adopted!! !- Black Standard Poodle Puppy Boy! Adopted!!! 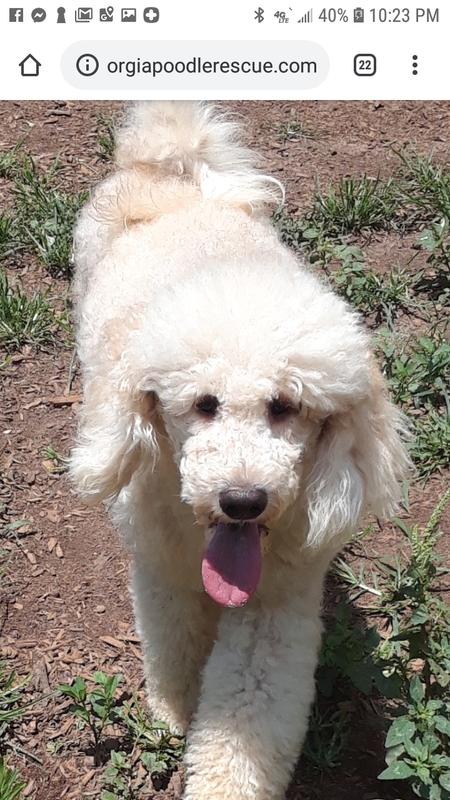 ANNIE – Cream Goldendoodle Girl!!! 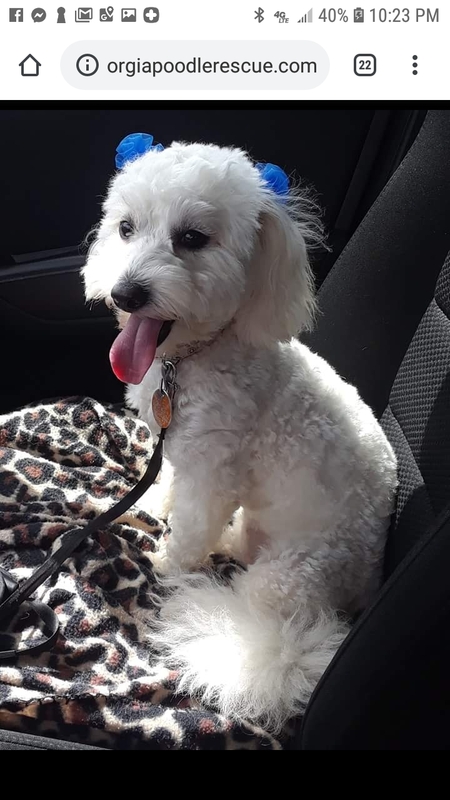 Adopted-BANDIT-SILVER AND WHITE TOY POODLE MIX!!! Hi, my name is Bandit! 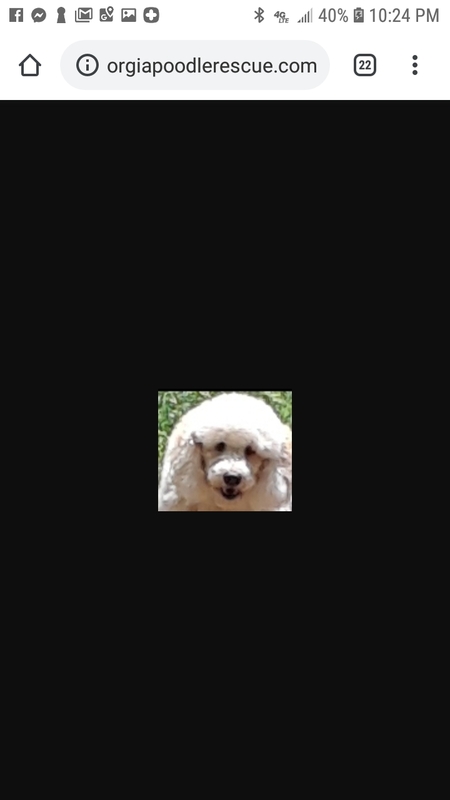 I am a silver and white toy poodle mix with curly poodle hair. I came here about 4-5 lbs overweight. I keep my head down probably due to my weight, which I’m trying to lose, but I have lifted my head several times. I just turned 5 years old in March 2018. My first mom couldn’t keep me because she was moving. 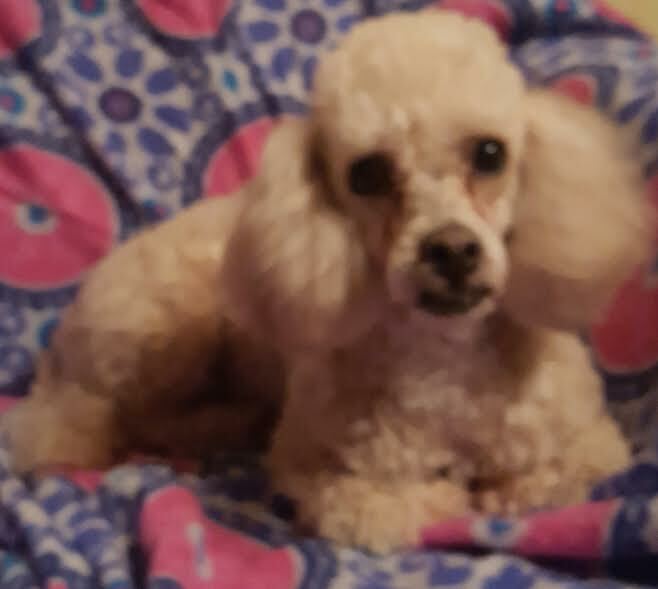 My second mom said dad was in and out of the hospital with heart and back operations and I was being left alone for long periods of time and said she wanted better for me so she asked Georgia Poodle Rescue to find me a family who can devote time to me. I know, come, sit, stay and high five! I am very friendly, love to go for walks, love other dogs and people my size and I like toys, too. 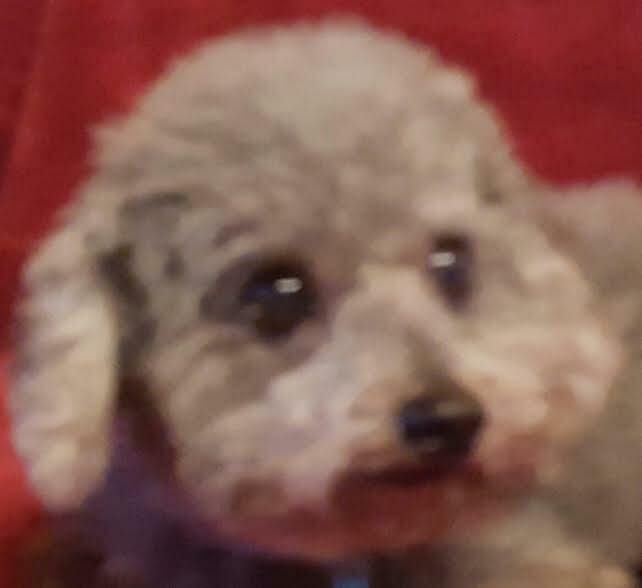 I’m crying because I miss my mom and dad, but Georgia Poodle Rescue said it will be okay and they will find me a good home. These pictures are of me in the van being transported. No Crating! Adopted!! !-Hershi – Cafe au Lait Toy Poodle Boy! Adopted!-Little Man – Cafe au Lait Toy Peke-a-poo Boy! Little Man is a very cute cafe au laut peke-a-poo. He came together with his father, Hershi, who is a cafe au lait larger toy poodle boy. 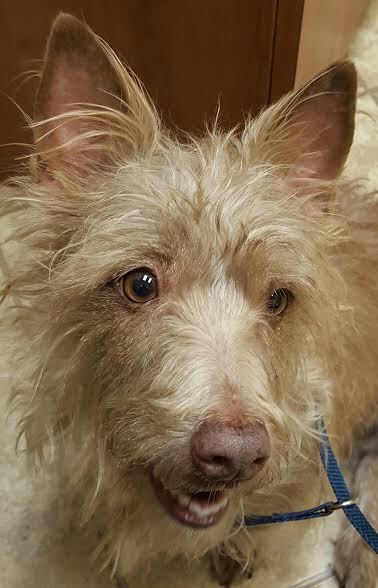 Little Man is 1.5 years old and is also neutered, vaccinated, and updated on his heartworm test (neg.). They do not need to be adopted together. He is very sweet, quiet, and loyal, following you around once he gets to know you. More pix coming soon. No crating! ADOPTED!!! 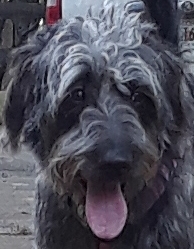 Susie Q – Silver and White Very Young Schnauzer Doodle Girl! 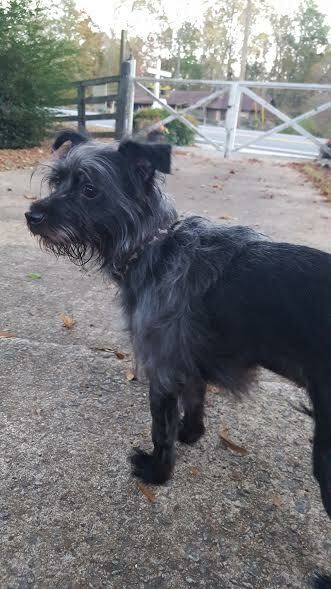 Susie is a beautiful little schnauzer mix who came to us from the family breeding out of control. 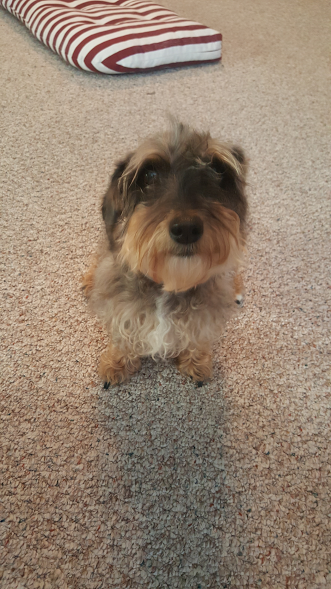 Her mother is a miniature schnauzer and Suzie looks all schnauzer. Her siblings all turned out to be 30-40 lbs but they think Suzie will not get more that 15 lbs. She just turned 3 months old the beginning of September 2017, loves to play, and loves the company of people and other friendly dogs her size. She is a little lover girl! $500 ADOPTED!!! 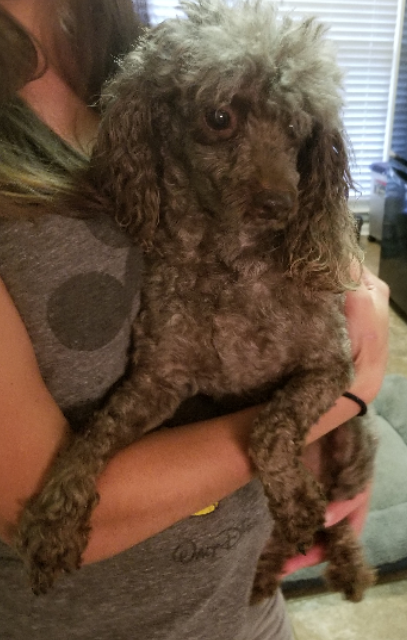 Lilly – Red Toy Poodle Girl. BOTH ADOPTED!!! 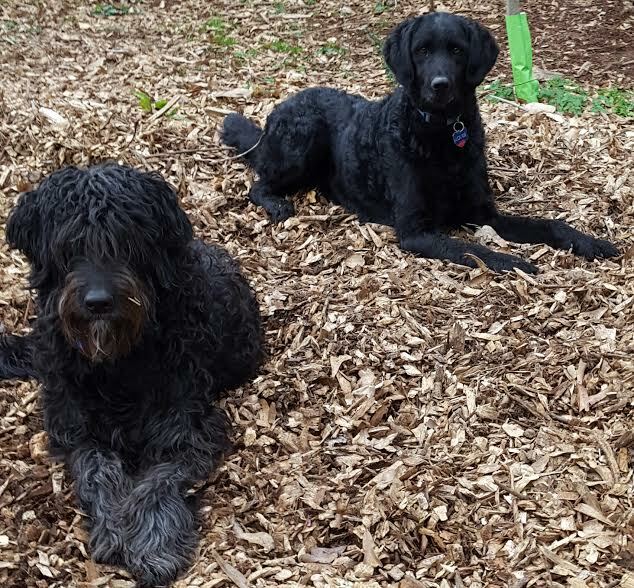 Thelma and Louise – Black Labradoodle Girls! Update: Louise is available but Thelma was adopted. 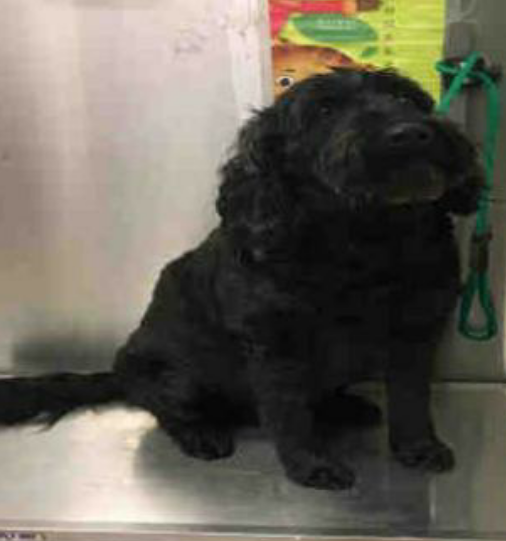 Thelma and Louise are two black female labradoodle girls who just turned 4 years old. Here they are shown relaxing outdoors after a romp in the hay! THEY CAN BE ADOPTED SEPARATELY. They were purchased from someone who couldn’t keep them because they were moving and to be service dogs for their new owner. 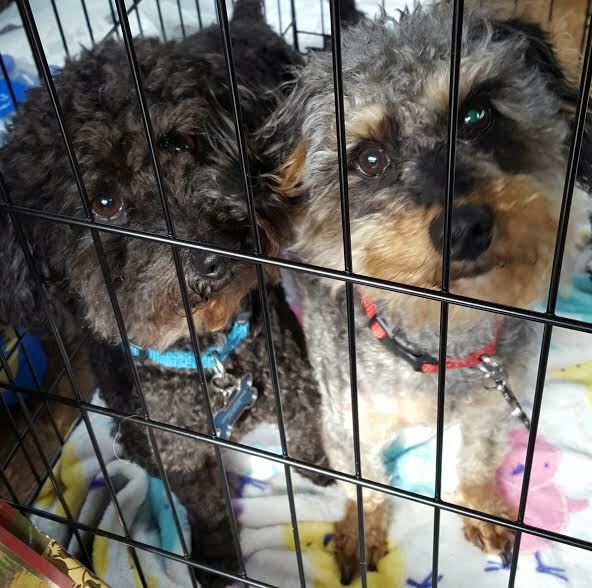 The dogs, however, were not socialized with other dogs nor with people, so they came to Georgia Poodle Rescue for us to train them and find them a good home. Thelma and Louise have now been socialized by us with our dogs and get along fine with them. They have very nice personalities. We are vetting them and scheduling their spay appointments. Thelma weighs about 45 lbs, is the dog on the left in the picture, and has the voluptuous long fur with large curls, and Louise weighs about 52 lbs and has a lab short fur on her head and beautiful ripply wavy fur on her body. They have done very well with their training! No crates. 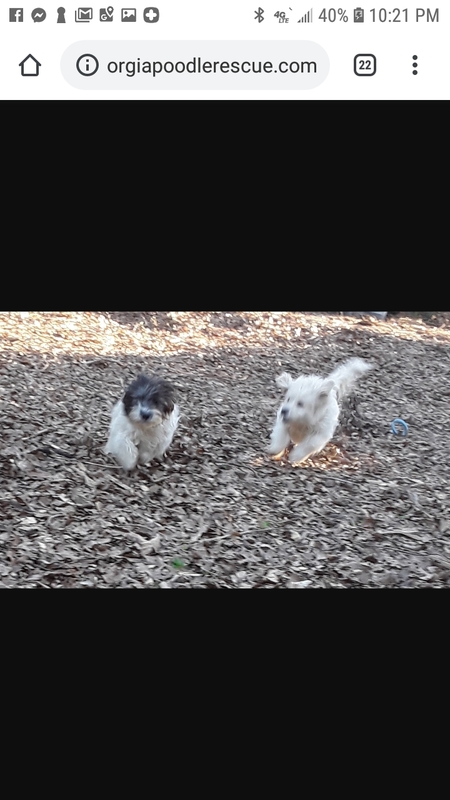 These girls love to romp and run at full speed. ADOPTED!!! 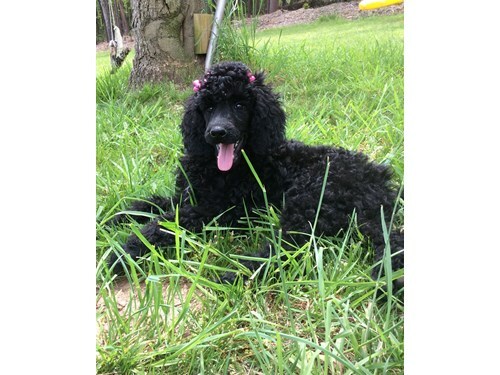 LUCY LU – Black Standard Poodle Puppy Girl! Hi, I’m Lucy, a playful black standard poodle puppy girl born 1.24.16. I just turned 1 year old, am taller than most female standards my age, am very energetic and I need my exercise needs fulfilled with running. Simple walks will not due….even long walks. Here is a picture of me playing Queen of the Hill with my tug toy. It’s fun! 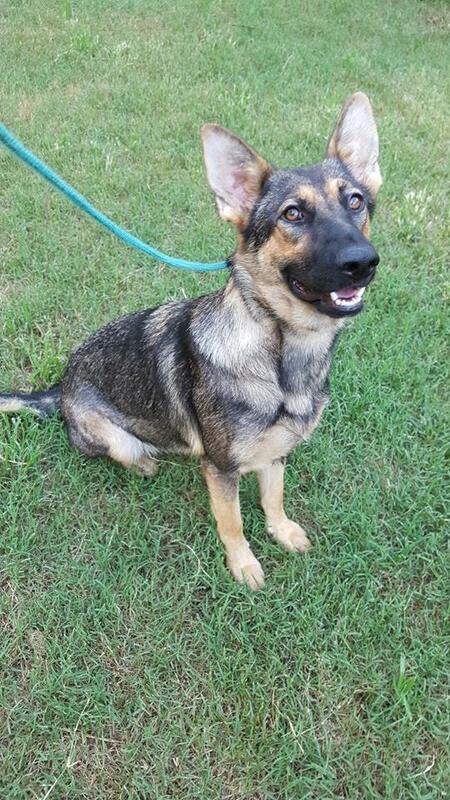 I am a very friendly girl and love to play with other friendly dogs. I can run really fast, too! I come when called and I know sit and short stay commands. I’m a happy girl and usually have a big smile on my face waiting for you! I’m looking for a loving home that knows how to take care of me. You must be able to run with and play with me…..not just let me out to potty and then back in. I am a very nice, calm, happy and playful girl! We could be buddies forever! To Meet Me, view the tab, How To Meet Our Dogs! No crates. ADOPTED!!! 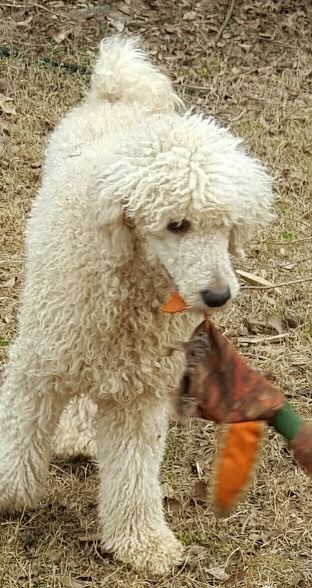 BRITTNEY – AKC registered Moyen Standard Poodle Girl with White Bib on Chest! Profile and pictures on our FaceBook page and will be copied here. ADOPTED!!! 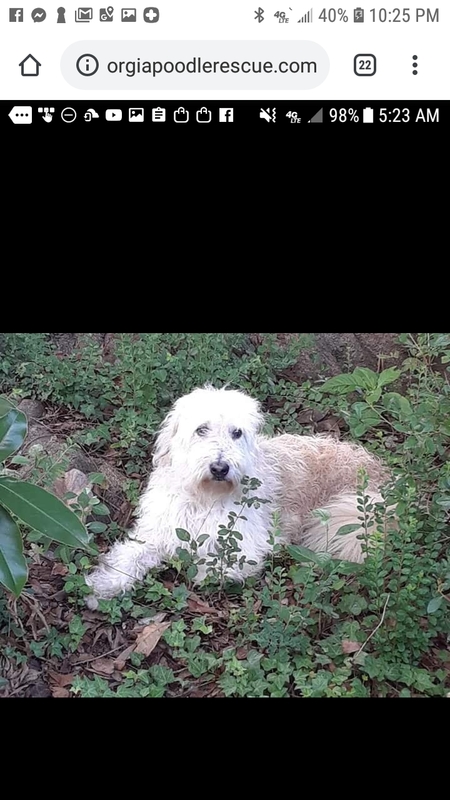 COCO – Cafe au Lait Labradoodle Girl! ADOPTED!!! 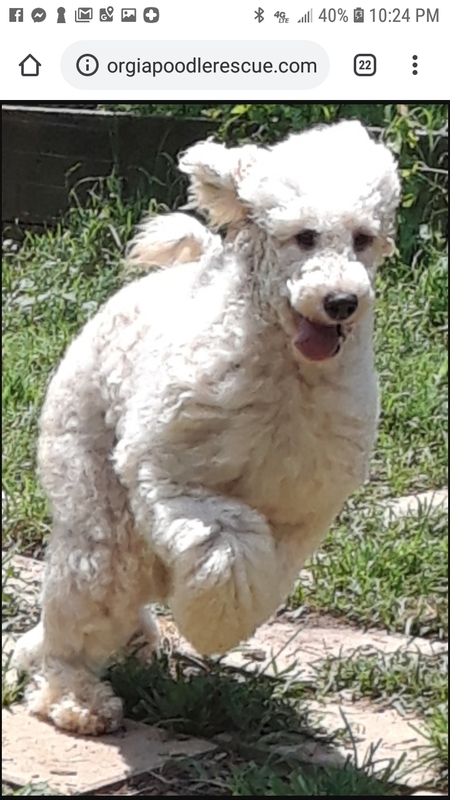 LATTE – Cafe au Lait Standard Poodle Girl!!! 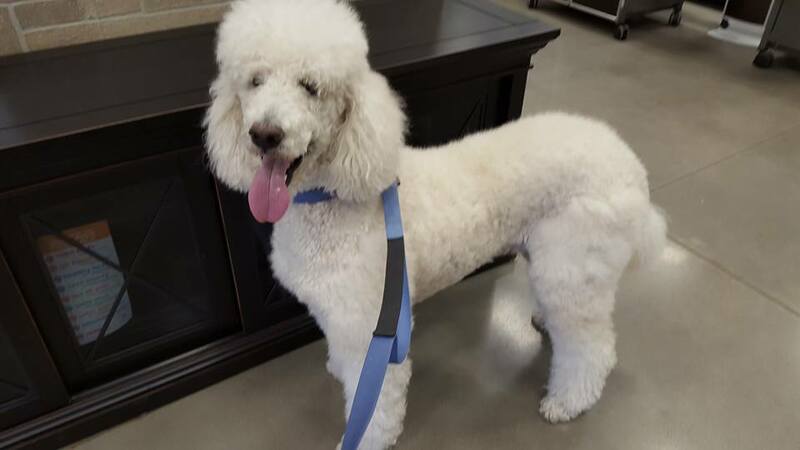 Latte is a full sized cafe au lait standard poodle girl and weighs about 45 lbs. She has the beautiful amber eyes, liver nose, and liver gums with my fur looking more gray when it is clipped shorter. It looks more caramel when it grows longer. She was born at my former owners home. Her former owner developed medical problems needing expensive treatment and already had two other dogs so she sadly had to give me up since the other dogs were older and I would have an easier time of finding a home. 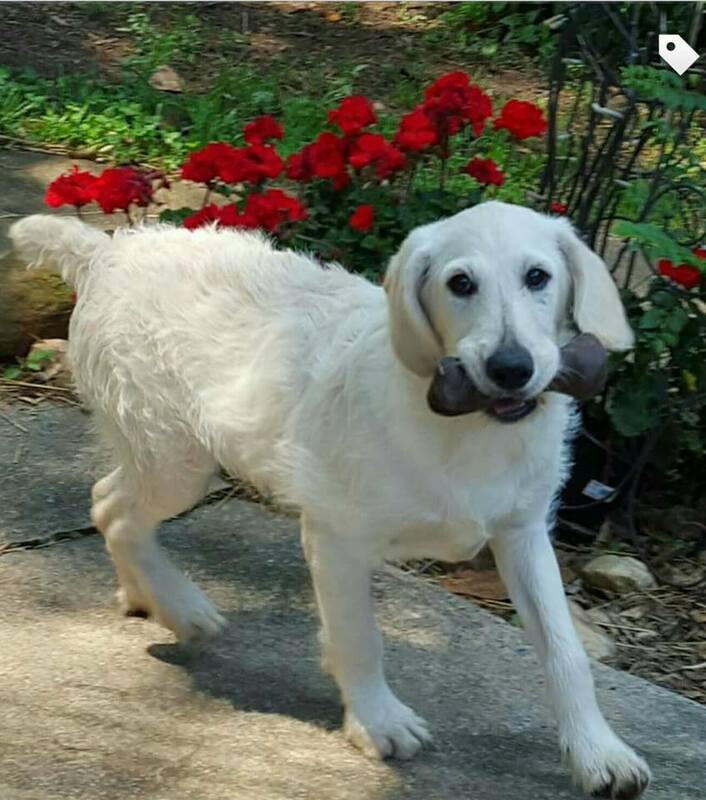 She told me Georgia Poodle Rescue would help me find a good home. I already had a good haircut here and look beautiful and even had some real chicken! That was yummy! I am very sweet and like to hang with my people! I get along with small and with large dogs but don’t like when the smaller dogs take my toys. Larger dogs can play with me with my toys. 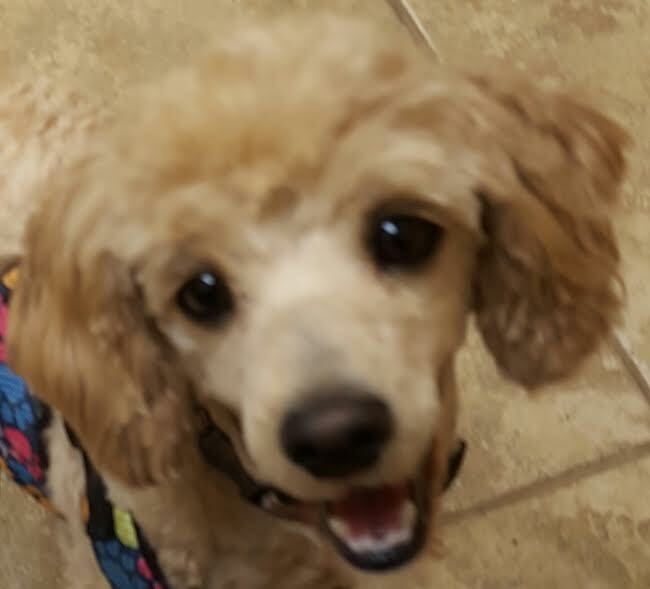 Georgia Poodle Rescue just had me spayed and brought me up to date on my vaccinations, heartworm tested me negative, and groomed me beautifully! View the policies and email for an application to meet beautiful, happy, playful me! No crates. ADOPTED!!! 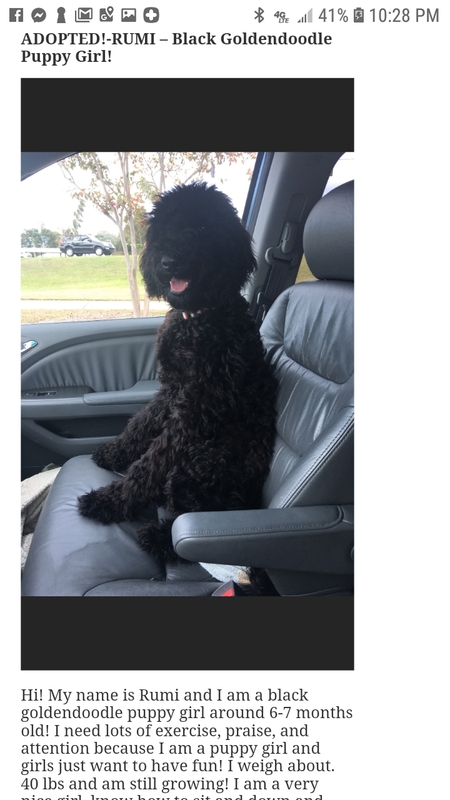 EVA MARIE – Black Giant Schnauzer Standard Poodle Girl! 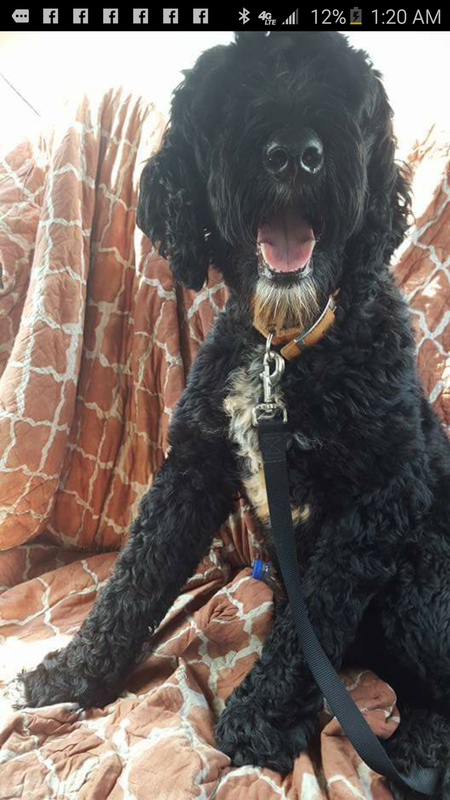 Eva Marie is a black 2 year old giant schnauzer standard poodle girl , whose DOB is 7.12.15. She has very luxurious wavy hair and has a white bib and beard as well. She is very friendly with people and digs and loves to play with both. Her owners lost their home and moved into an apartment and kept Eva at their dad’s place but he was in his 70′s and she was too much energy for him. ADOPTED!!! 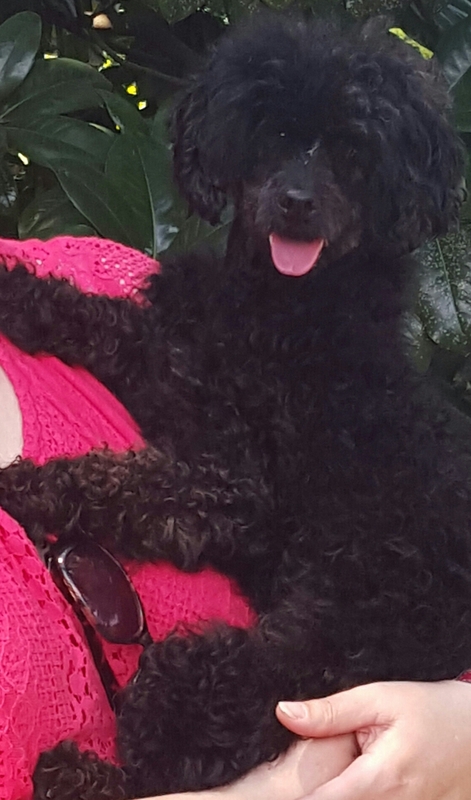 Missy – Black Toy Poodle Girl! 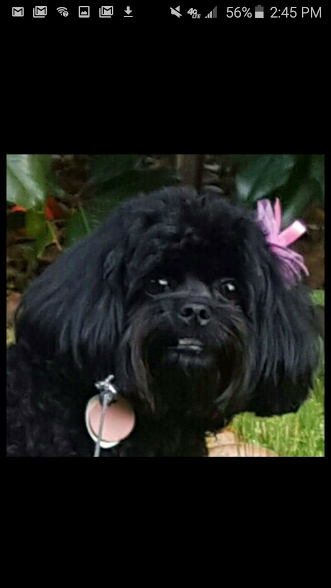 Missy is a 10 lb black toy poodle girl. She is cute, fun, and cuddly. She loves playing with other dogs her size and giving kisses to and cuddling with her person. Her former owner could no longer keep her due to her work schedule. We spayed, vaccinated, dewirmed, heartworm tested, microchipped and socialuzed this little princess. She is a cutie pie! ADOPTED!!! 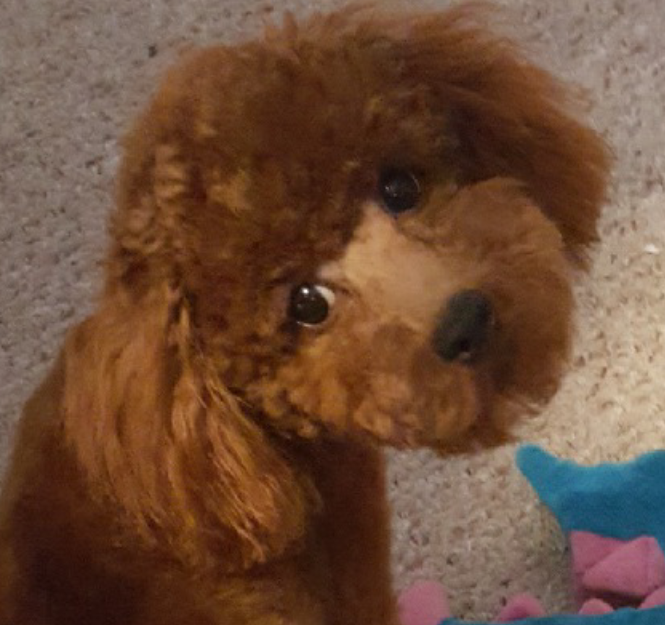 JoJo Blaze – Red Toy Poodle Puppy Boy!!! JoJo Blaze is a deep red toy poodle puppy boy born 2.12.17. He is playful and friendly and is lookinh for a home with people he won’t outlive and who will have someone home with him a lot as a puppy requires a lot of time! ADOPTED!!! 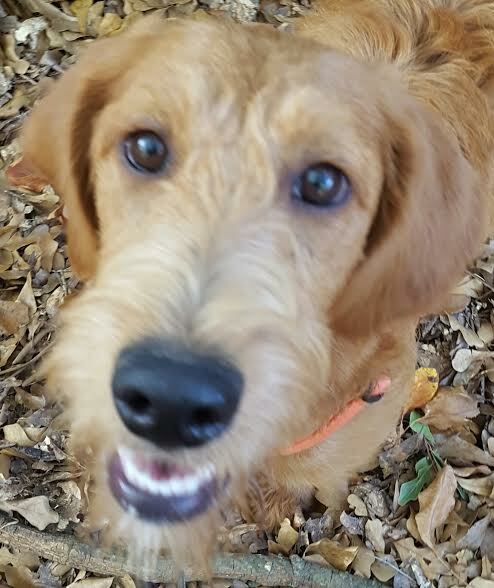 Sophie – Cafe au Lait Cairndoodle Girl! ADOPTED!!! 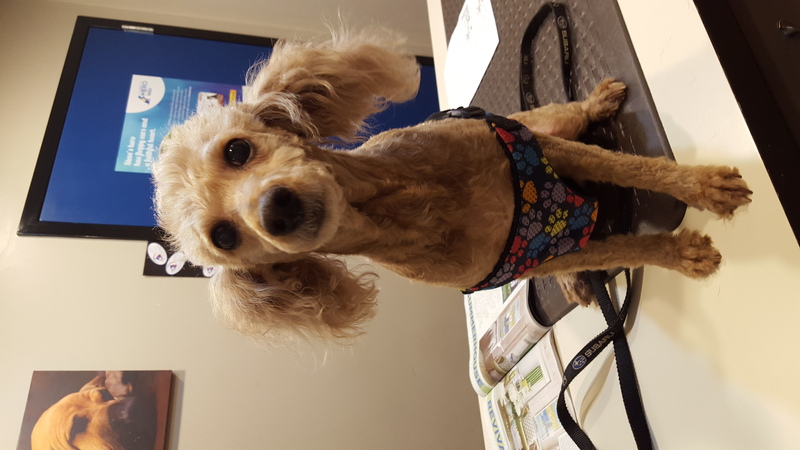 Zaida – Apricot Female Miniature Poodle Girl! ADOPTED! COPPER – Silver, White, & Copper Toy Schnoodle Girl! 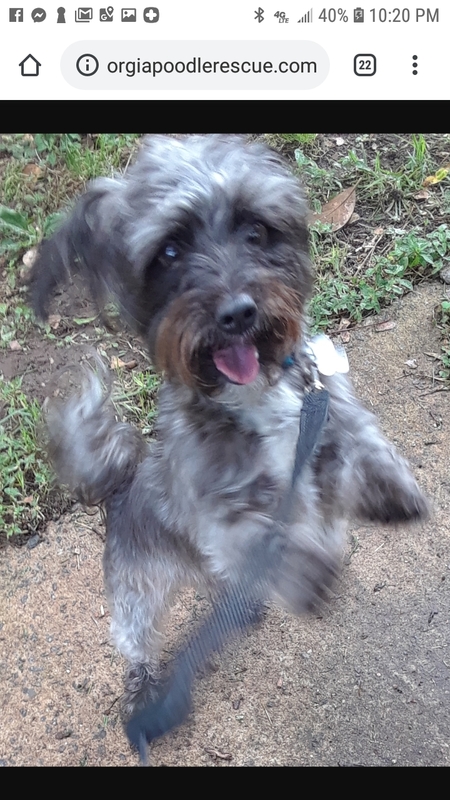 Copper is a 4-year old female tri-colored, silver, white, and copper toy size poodle and schnauzer mix called a schnoodle! She was born March 2013, weighs about 11 lbs, and came with her name. She is a precious girl! 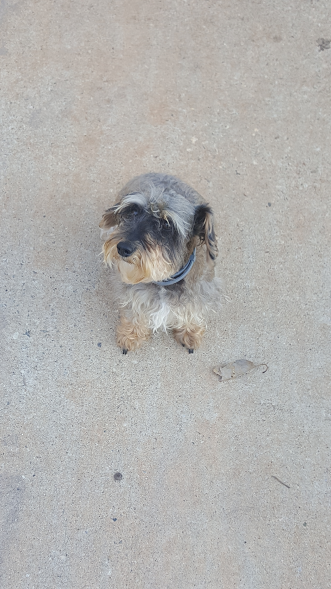 She has a wonderful schnauzer personality and can nip if she feels fearful. Her former owners did not have a fenced yard and Copper wore a shock collar along with her two lab siblings at her former home. She loves people and loves older, respectful children. Copper came to us as a scared but happy little girl. We gave her good training of the mind and she quickly became a wonderful, happy, well adjusted little girl and loves to go outside and play with the other dogs and with her person! No shock collars for Copper! No crating! ADOPTED!!! 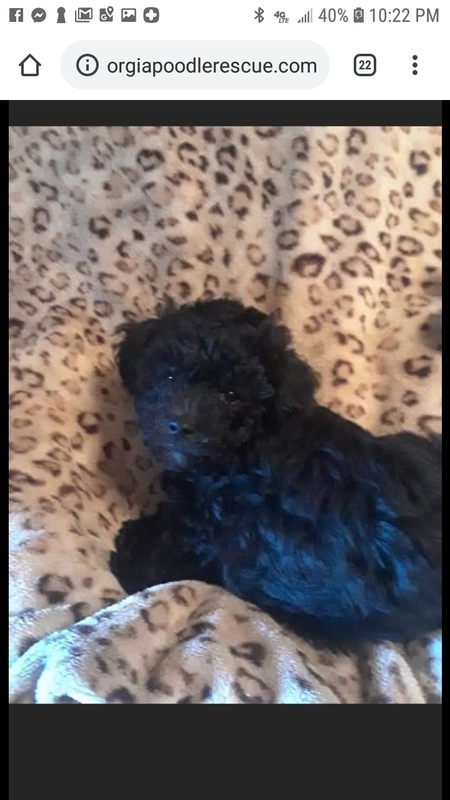 IRIS – Dark Black Toy Poodle Shitztu Mix Girl! Profile on our FaceBook page and will be copied here. Hi, my name is Chloe! I was born 2/4/16 and am a very cute and well behaved black and tan yorkiepoo girl! I weigh 17 lbs! I came from a family who didn’t have time for me so sold me to my recent family. My recent family worked all day and did not have time to potty train me. 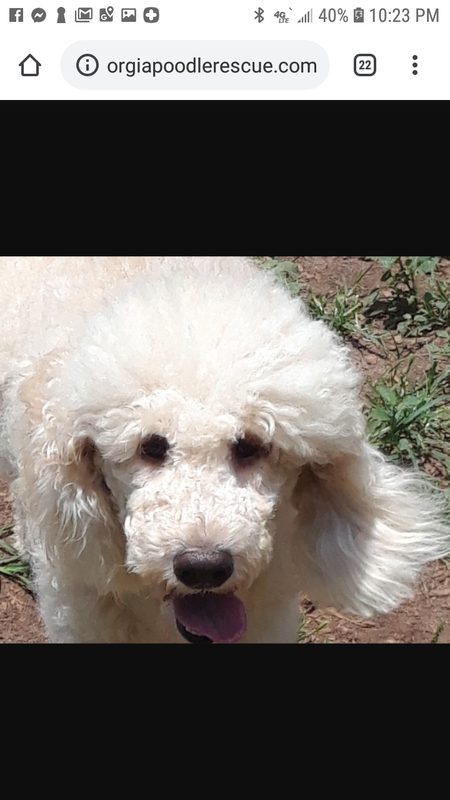 So here I am at Georgia Poodle Rescue having fun and learning all types of new things, especially potty training. They said I am doing very well! 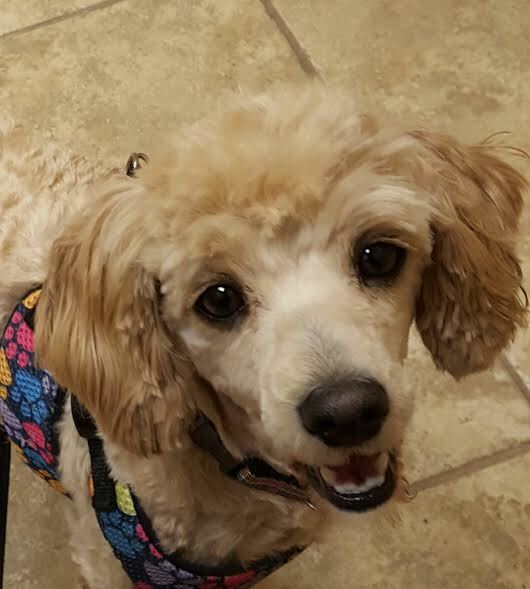 Georgia Poodle Rescue had me spayed on April 6, 2017! 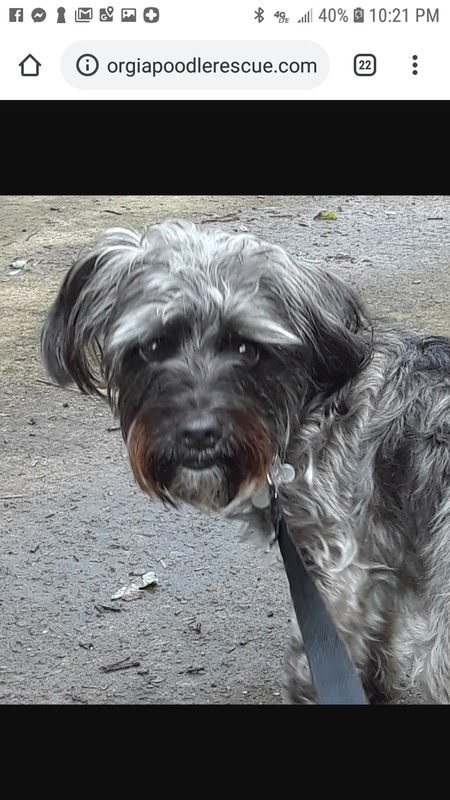 I am very good with people and with other dogs and am a quiet little girl but will sometimes bark to alert you to something. I weigh about 15 lbs. 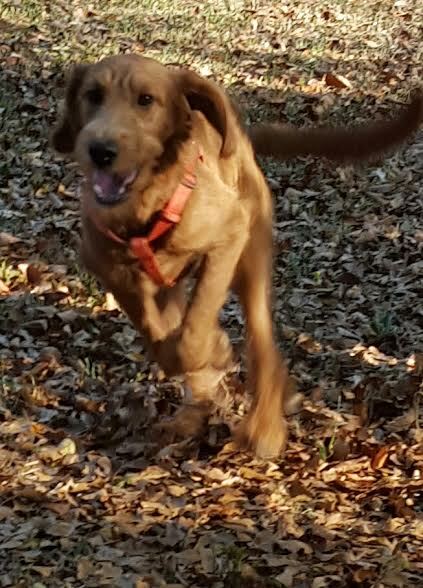 I will do best in a home with a fenced yard because I can run around playing super fast and love doing so. No crating. Adopted!!! CARLEY AND MAX – Blue and Silver Brother and Sister Standard Poodles! 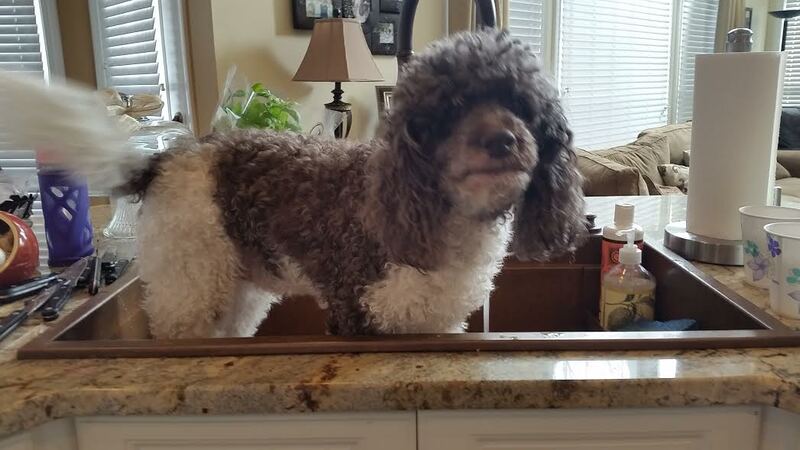 Carley and Max are two four-year old brother and sister standard poodles. Carley is blue and Max is silver or light blue. They came to us from a person who had cancer and could no longer care for them so they dumped them at a kill facility. Our wonderful volunteer, Mary, found out about them and brought them to us. 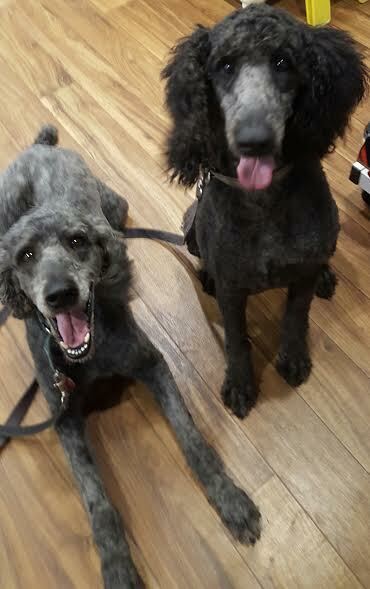 We have groomed and evaluated them and two very good looking poodles appeared under all that hair! Their top knots were already short and jagged so we evened it up and the top knots will grow back. They are bonded with each other so need to be adopted together. Their father was an AKC registered dog and we have the AKC certificate. They get along with small and large dogs, are very friendly, are cuddlers, are very obedient and well behaved! We can’t say enough good things about them! So if you are looking for a wonderful pair that you can begin bonding with immediately without having to deal with the training, these are the two for you! Please view our tab entitled, How To Meet Our Dogs, to begin the process for a meet and greet! ADOPTED!! !Christa – Apricot Cockapoo Girl!!! Hi! My name is Christa! 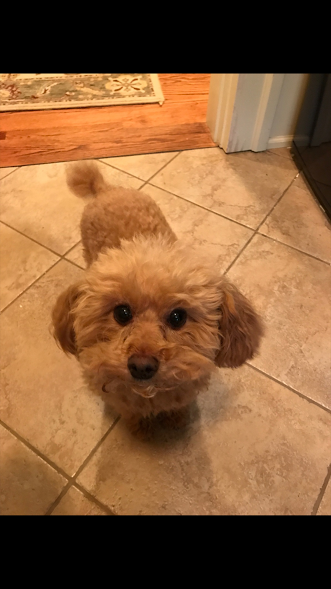 I am a small miniature/large toy apricot cockapoo girl! I am a little over 2 years old and weigh 14.5 lbs. 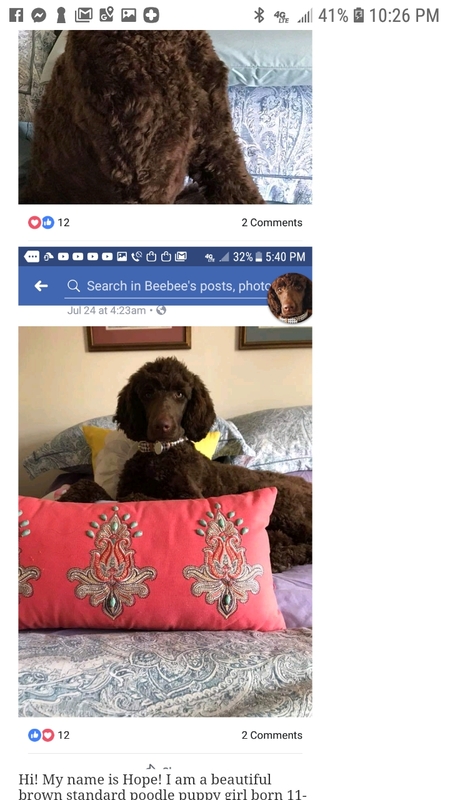 My former owner wanted Georgia Poodle Rescue to find me a good home. I kept wanting to be outside with two large dogs I lived with. 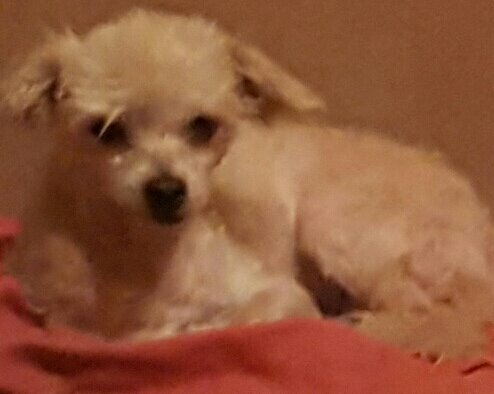 Georgia Poodle Rescue has had me spayed and vetted. GPR updated me on my vaccines, and I heartworm tested negative. I have a very friendly and sweet personality, I like to be right by your side wherever you go, I like when you talk to me and I like to cuddle and give kisses. I also like playing with other friendly dogs. Here are a few pictures of me. The last picture is me when I arrived at GPR. See how nicely I cleaned up and how beautiful and cute I am? I am looking for an owner that I won’t outlive. Please read the policies first and ask for an application. No crating. ADOPTED!!! 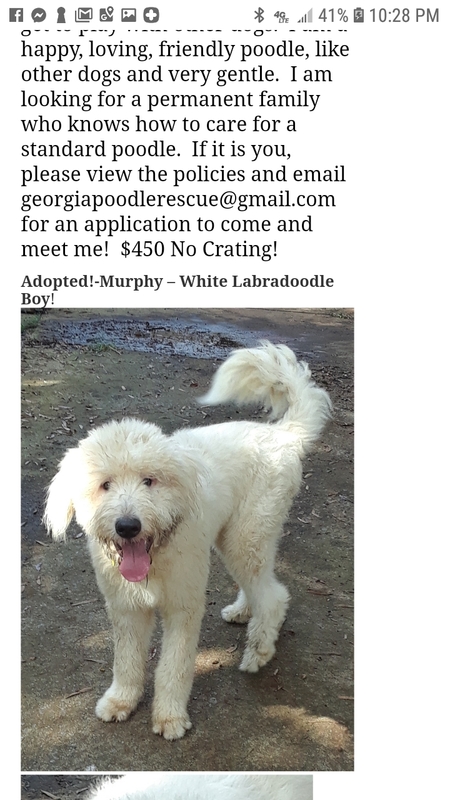 MURPHY – WHITE GOLDENDOODLE BOY!!! ADOPTED!!! 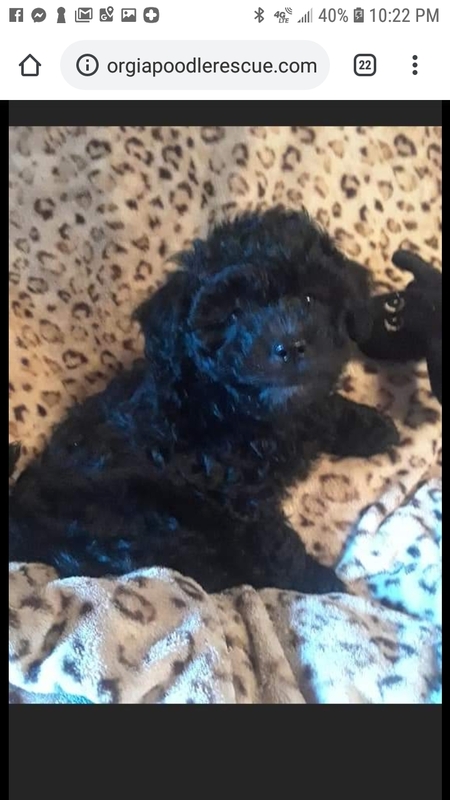 Sophie – Black Teacup Toy Poodle Girl!!! 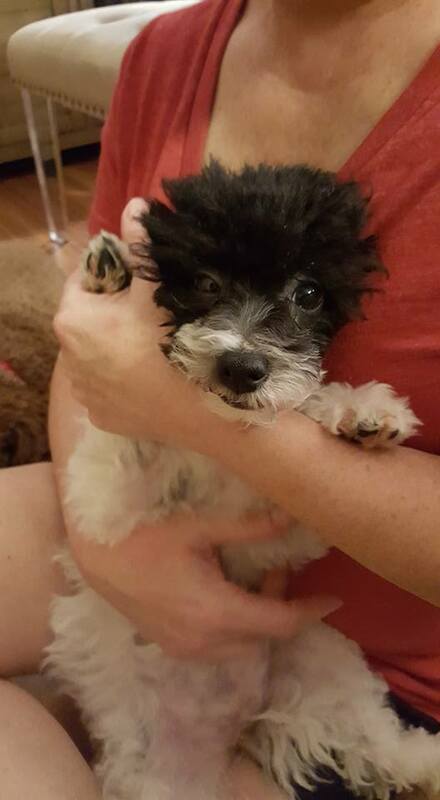 Sophie is a black teacup toy poodle girl who was born 07/30/15. She was purchased from a breeder by her first owner but her owner did not have time for her so she sold her to her second owner, who now does not have time for her and wants her to go to a good home. Sophie’s father is a champion and his name is Maverick and her mother’s name is Vanna. 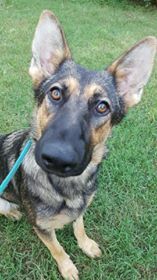 Her parents are AKC registered, but we do not have the paperwork. Sophie is well trained and weighs about 6 lbs. She is spayed and we are updating her on her vaccines. She has a wonderful little dainty walk and personality and is not a yapper. She is a quiet and well behaved little girl and gets along with other dogs her size. She is a friendly little girl! My name is Vada! 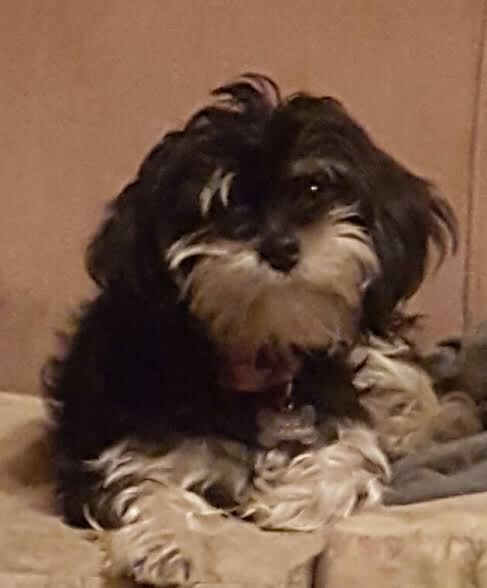 I am a 6.4 lb teacup toy maltese/shihtzu mix puppy girl! I was born chocolate brown and am turning into a beautiful two-tone dark silver and light silver color with white. 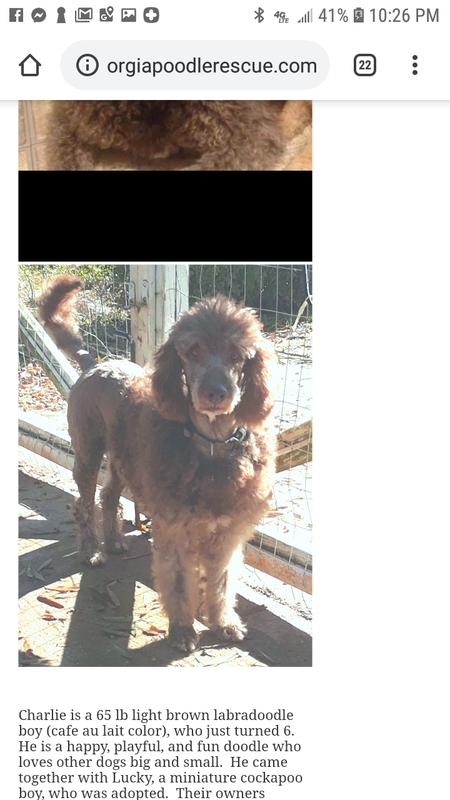 I am updated on my vaccines and Georgia Poodle Rescue will have me spayed and further vetted on March 21. I was purchased from a breeder and was with my mom since I was 8 weeks old. I have a very nice, friendly, quiet personality and am still discovering and learning about the world around me! My mom’s extended family moved in and their baby took one of my poopies into her mouth. 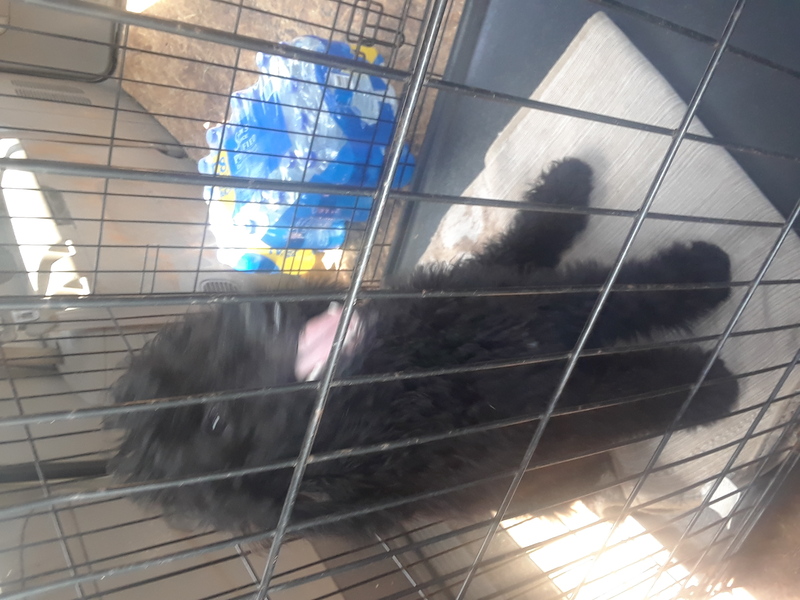 They realized the new situation was the wrong one for me so asked Georgia Poodle Rescue to find me the right home with no young children. If you are interested in meeting cute, tiny little me, click on the How To Meet Our Dogs tab. No crating. ADOPTED!!! 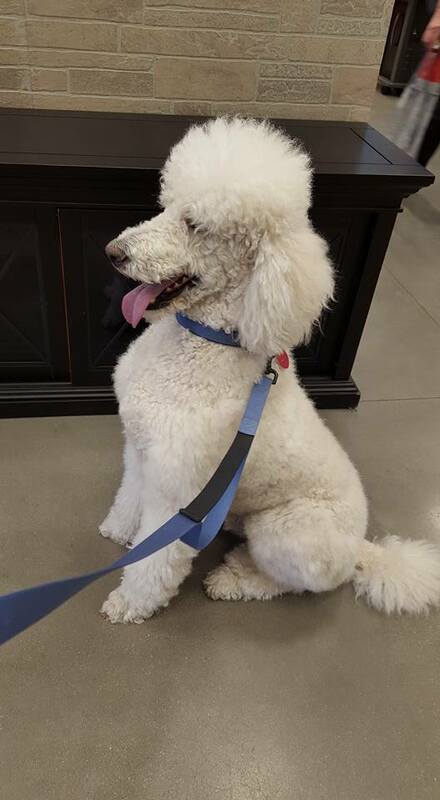 WINSTON – White Standard Poodle Boy! 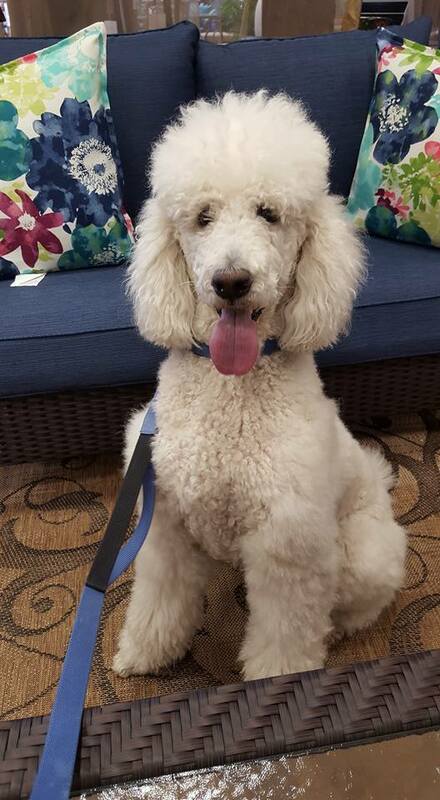 Winston is a beautiful white standard poodle boy. He is 4 years old as of February 2017. He belonged to a family whose daughters went to college and the parents wanted to travel so they sold him on Craigslist to a woman who had small children and no fenced yard. Since the weather was warm, the woman walked Winston2 together with her babies in their stroller. When the weather became colder, she couldn’t walk the babies in the cold but Winston2 still needed his exercise and to potty. She realized he needed a fenced yard and asked us to find him a good deserving home. Winston2 is beautiful. He is well adjusted, loves other dogs, is potty trained, loves people, and loves attention and love! He will make someone a very nice dog! He weighs about 55 lbs. No crates. ADOPTED!!! – LUNA – WHITE MALTIPOO PUPPY GIRL!!! Hi! My name is Luna! 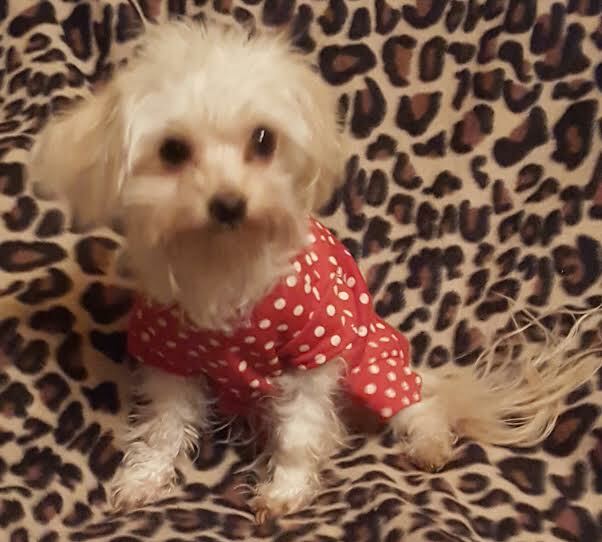 I am a young white maltese/toy poodle mix girl born 4/19/16 called a maltipoo! I am very friendly and playful. I am potty trained. I am spayed, I love other dogs my size and I like people. My first family purchased me off Craigs List. They had three boys. They didn’t have time for me. My second family purchased me from the first family and also gave me a good home and loved me, but their travel and work schedule changed where they were flying to other states every week. 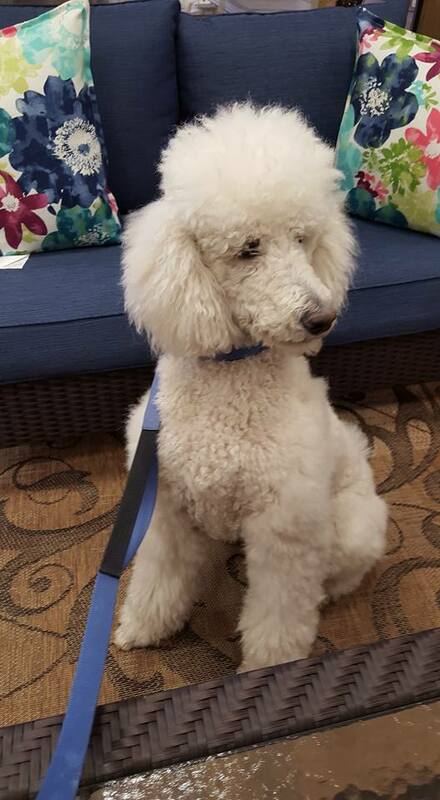 It wasn’t fair to me so they asked Georgia Poodle Rescue to find me a good home. I weigh about 12 lbs. No crating. ADOPTED!!! 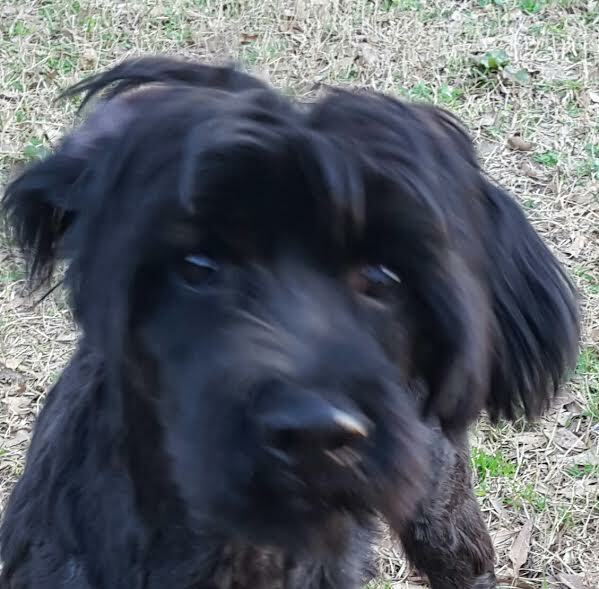 Casey – Black Miniature Schnauzer Boy!!! 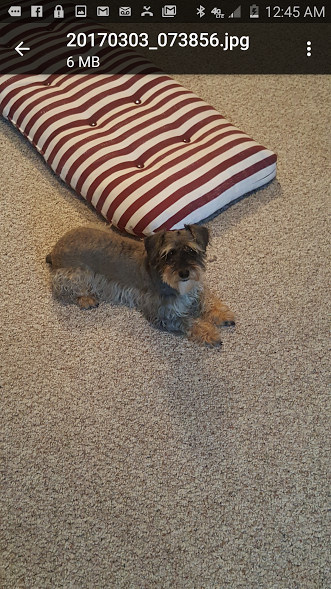 Casey is a one year old black miniature schnauzer boy as of February 2017. He was found as a stray, was in animal control, and no one came to claim him so he came to us. He came to us very overgrown as you can see in the third picture. We groomed him and a very cute little boy emerged! He is neutered, tested heartworm negative, and is up to date on vaccinations. 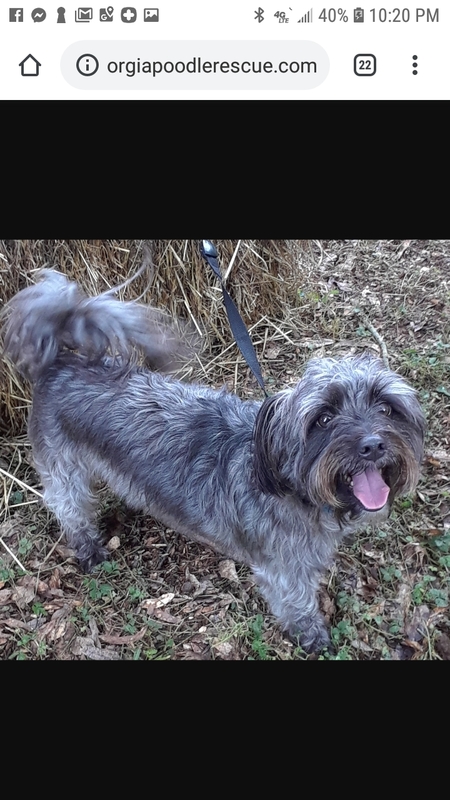 He is a very friendly little guy and friendly with other dogs as well. Because of his age, he needs to be as energetic as him and run and play with him. He likes to be with his person. He is very spunky, nice, and can frolic and run and come back to you when called. 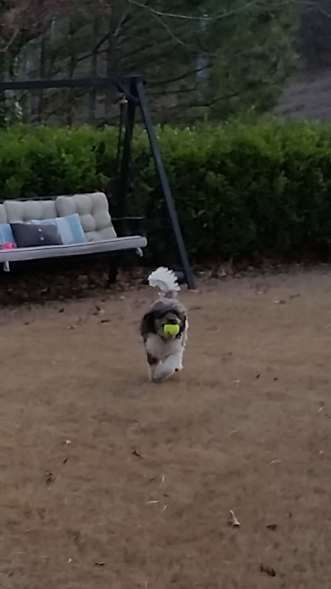 He loves to play fetch with the ball and brings it back to you! He weighs about 25 lbs. No crating. ADOPTED!!! 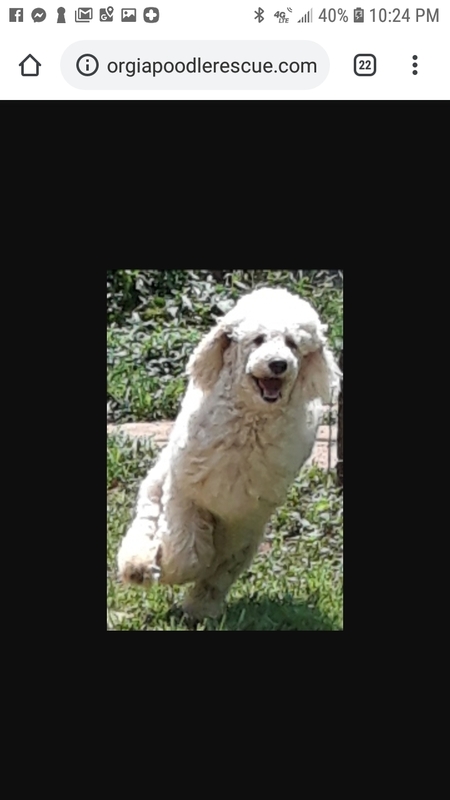 Chico Rico Ragu – Brown/White Parti Miniature Poodle Boy!!! Chico was purchased as a puppy from a breeder by a couple in their 90′s. They tried but did not have the energy, training expertise, nor time that he needed. He then went to live with a family member for a few years. That family member lost her job. Chico then went to live with another family member, but their children and family were too active for him. We are presently training Chico. He gets along very well with other dogs and likes people. Adult household with no children/no grandchildren. He has his beautiful natural tail! He weighs 15-18 lbs. No crating. ADOPTED!!! 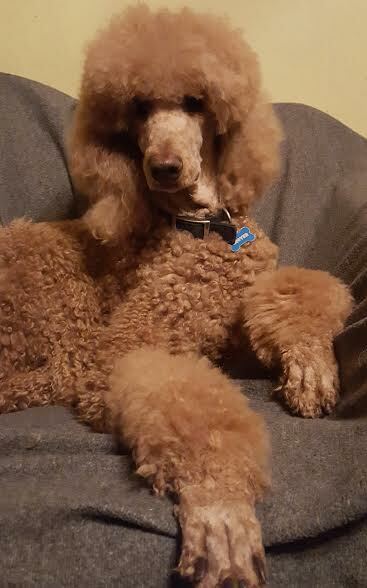 GROVER – Red Standard Poodle Boy! 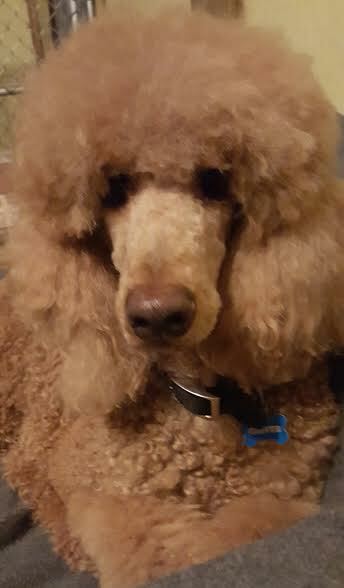 Hi, I’m Grover, a 5 year old, red, neutered standard poodle boy! My mom and dad purchased me from a breeder when I was a young pup. They recently had a baby and I wasn’t receiving the attention I was accustomed to plus I would be overprotective anytime someone came near the baby when we were outside on a walk. I am a friendly guy and get along with other dogs and like to play with them.. I can shake paw with both paws. I like to chill out on a couch or in my cushy dog bed. I know sit, stay, come, down, up…when I’m invited on the couch and “off” when I need to get off the couch. I know “spot”, which is my bed and I had a bed both upstairs and downstairs. 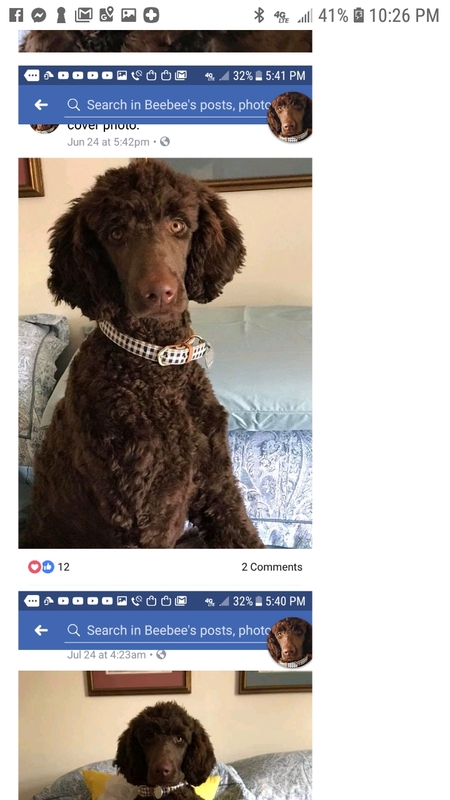 I pull on the leash but Georgia Poodle Rescue will help me with that. They will also update me on my vaccines and testing. No crating. ADOPTED!!! 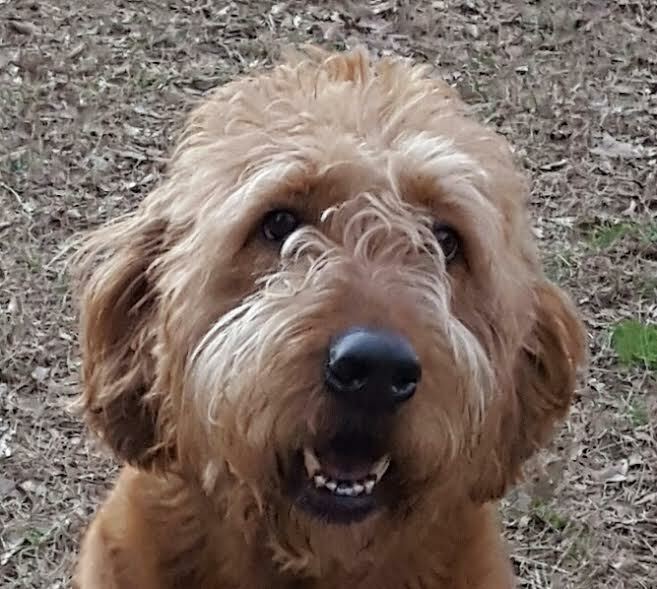 JOEY – Red Labradoodle Boy!!! Hi! I’m Joey! I just arrived! I am a red labradooodle born 03/26/13. I know sit, come, go to bed, speak and I give paw. I weigh about 68-79 lbs as of February 2017. 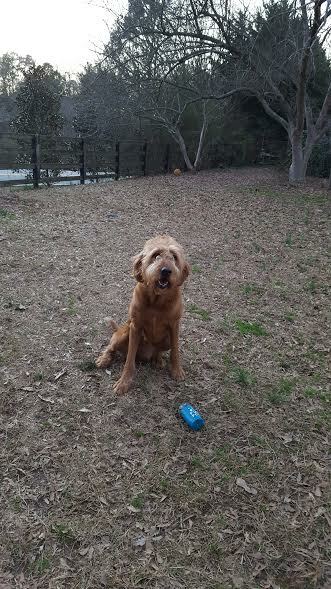 I love to play ball and fetch and retrieve it! 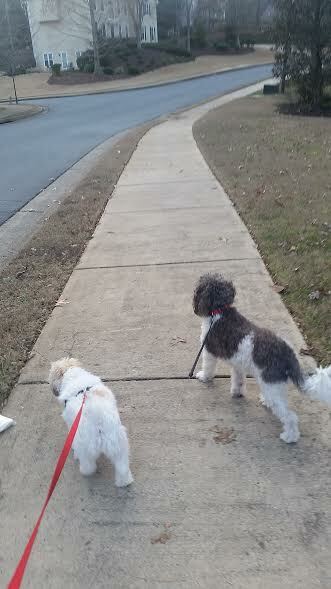 I know how to walk on a leash, too, and Georgia Poodle Rescue has taught me not to pull on the leash. They will teach you too! 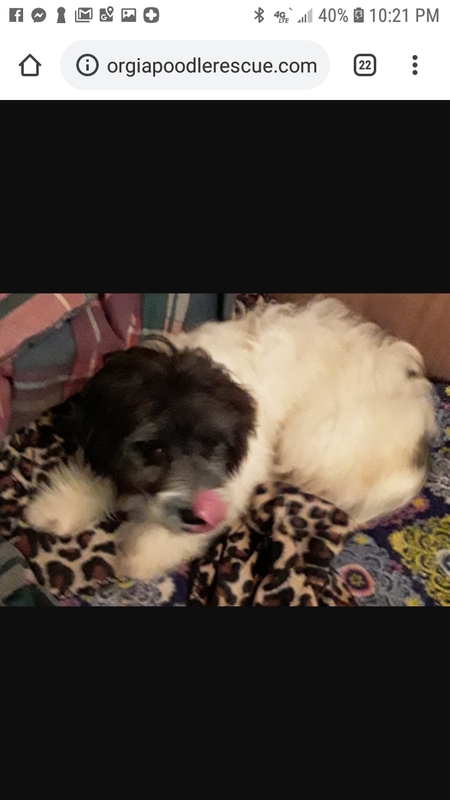 My owners purchased me from a breeder in South GA as a pup but due to their schedules they cannot give me the same time I need as they gave me before so they want me to go to a good family who can spend the time with me. If it’s you, then I want to meet you! Go to georgiapoodlerescue.com and view the policies then email them for an application to meet me. I can’t wait to meet you!!! No crating. ADOPTED!!! 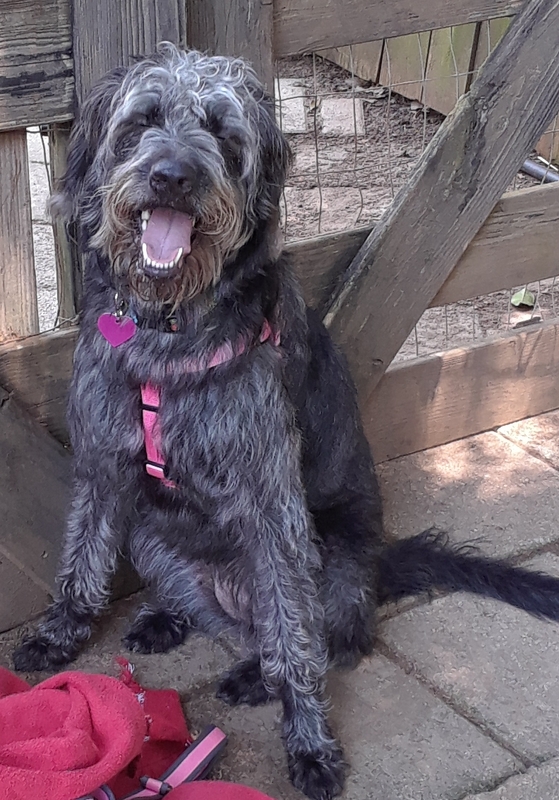 MARGEAUX – Black Labradoodle Girl! Hi, I’m Margeaux! 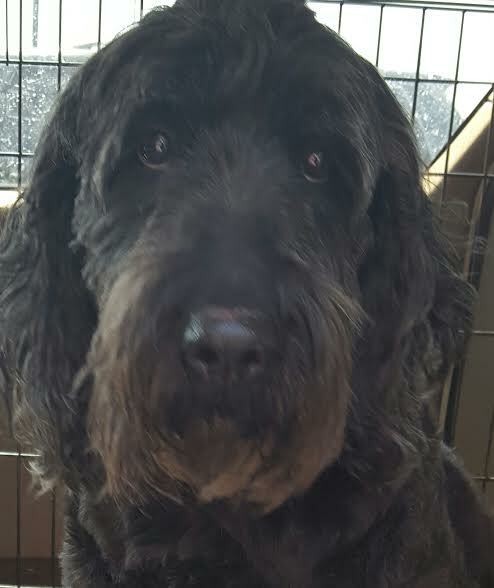 I am a 2-3 year old black labradoodle girl looking for a forever home where someone can take good care of me! These pictures show me when I am in the van being picked up from animal control and at animal control. I wasn’t smiling because I was scared but now I smile because I am a happy girl so look for more pictures. I am being spayed and was vetted. I came from animal control and was picked up as a stray dog. 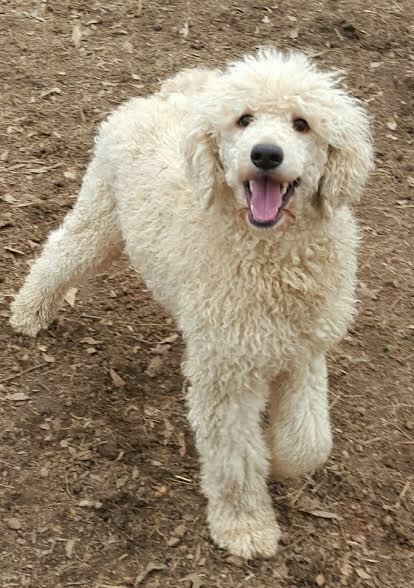 No one came to claim me after one week so I came to GA Poodle Rescue to be vetted and trained. So far I know sit, stay, come, shake paw, walk well on a leash, and love other people and dogs that I meet. I weigh about 75 lbs and since I am a large dog, I need a fenced yard where you can run and play with me in. I am good with small and large dogs! I am potty trained. I am a very sweet girl and a very good girl and long for my forever home! Royal and Wesley are a bonded pair. They are both 4 years old and have been together for nearly all of their lives. 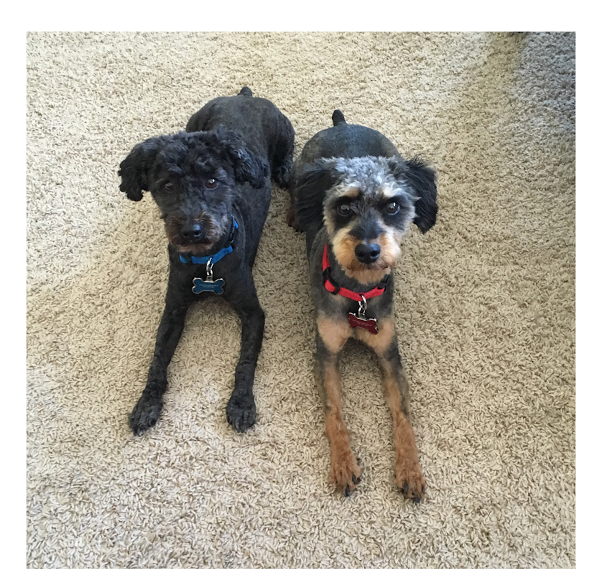 Royal is a silver and tan toy yorkie-poo boy and Wesley is a black toy poodle boy. Their owner inherited the pups after her nephew passed away, however, she travels a great deal for work and they spent more time in boarding than with her and she didn’t think it was fair to them so she asked Georgia Poodle Rescue to find them a good home together. Both little boys love to cuddle and snuggle. We are looking for a good family who will keep them together as indoor dogs and spend time with them. These pictures show both dogs in a down position and also in the van when they came to us. They are both sweeties! They are neutered, updated on their vaccines, potty trained, heartworm tested negative and microchipped. ADOPTED!!! RIVERSTONE - Cream Labradoodle Puppy Boy! Riverstone is a beautiful cream soft wiry haired labradoodle puppy boy. He was born 12/20/15. The former owner purchased him and then looked at her lease which said no large dogs so she asked us to find him a good home because she didn’t want to lose her lease. Riverstone is going to be a big boy. He has large paws and as of February 2017 he weighs between 70-80 lbs! He is super friendly, plays fetch with the ball, comes when called and loves, loves, loves all other dogs. He just wants to have fun and play. He is very inquisitive, very handsome, and we are looking for someone to be home with him a lot as he is still a puppy in a big body! View our policies at the end of this page and email us at georgiapoodlerescue@gmail.com for an application for a meet and greet. 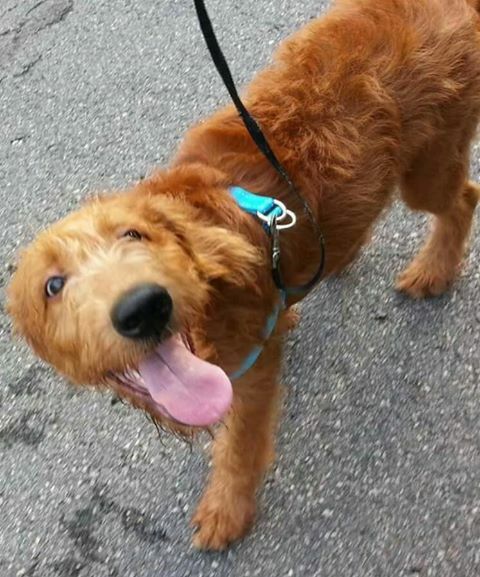 Come meet this big, gorgeous, super happy doodle guy! 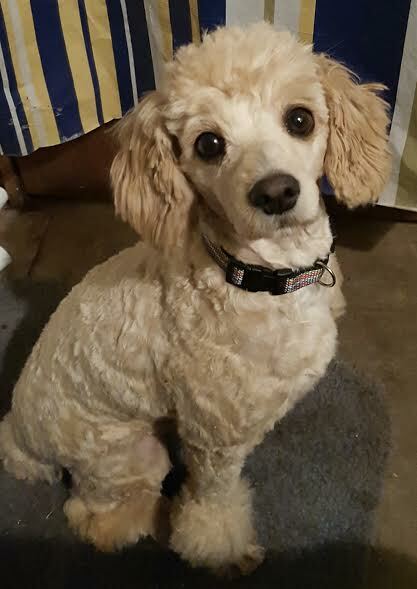 Bijou is a very cute 2-year old cream toy poodle boy with apricot ears! These pictures show him with longer hair and also with shorter hair. Right now he has shorter hair. He originally came from an owner who was moving into a home and could not take him there. He was adopted out and the adopters didn’t follow the instructions we gave them for an adopted dog to follow in the first 2 weeks, didn’t want to work on the training and basically undid all the training we gave him. He came back to us and we have retrained him again. We are looking for an adopter who will follow training protocol to have a happy, well behaved dog. Bijou is neutered, heartworm negative, and updated on his vaccines. He has a very friendly personality and loves playing with dogs and people. No children. He was adopted and then returned because the people were not ready to commit to continue training him properly.. Come meet this cute little fella! ADOPTED!!! 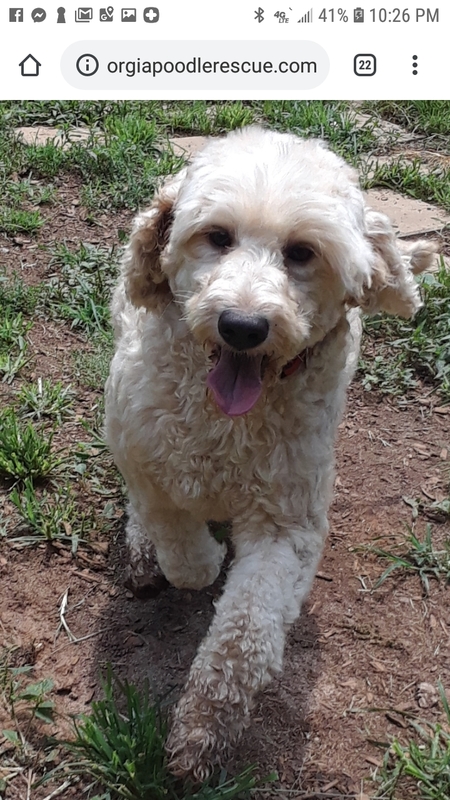 BRODY – CREAM GOLDENDOODLE BOY!!! 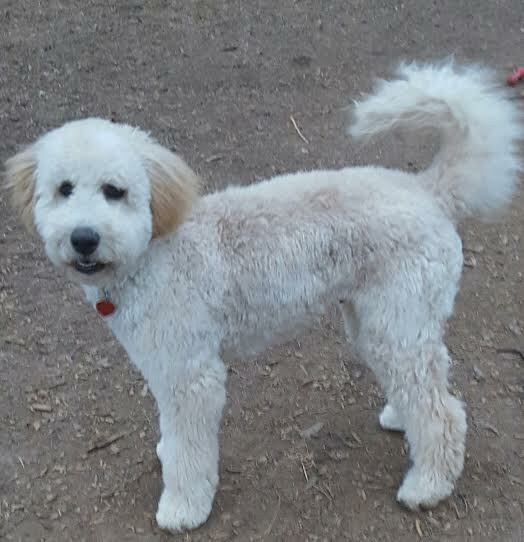 Brody is a 6 month old cream goldendoodle boy as of February 2017, with apricot ears. He will grown to a full standard size dog. He has a poodle coat. He came from a man who purchased her from a breeder since he was 7 weeks old. 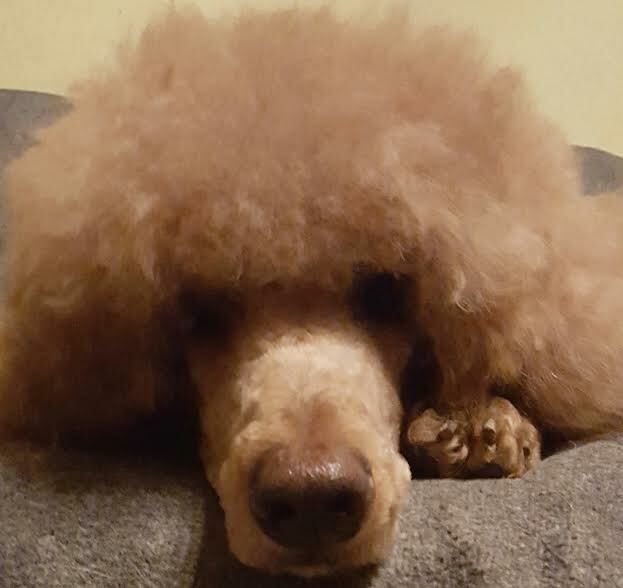 He loved Brody very much and gave him the best of everything but his mother became ill in another state and he has had to travel back and forth and work a full time job and it just wasn’t fair to Brody so he asked Georgia Poodle Rescue to find Brody a good home. Our evaluation shows Brody to be very well adjusted with people and with other dogs. He know sit, down, come and short stays. He waits until he goes outdoors to potty but he is a puppy so can’t be expected to hold it a long time. We are looking for a home for Brody where the people know this breed mixture and how to care for it and has the time for a puppy and will not place him in a crate. ADOPTED!!! 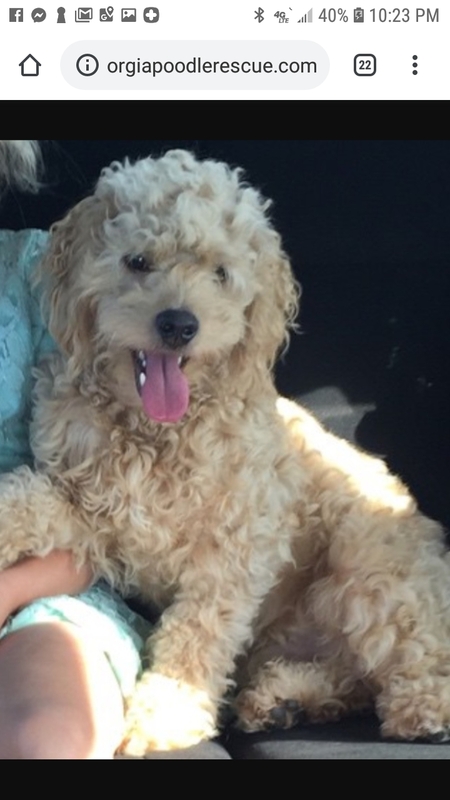 WINSTON1 – Cream Goldendoodle Puppy Boy! Winston1 is a cream goldendoodle puppy boy born 12/25/15. He came together with his brother Ranger, who was adopted. Winston1 has a poodle coat. We would like there to be another dog in the home who Winston1 can play with. He has a very charming, outgoing, and playful personality and loves to play, play, play with the other dogs. 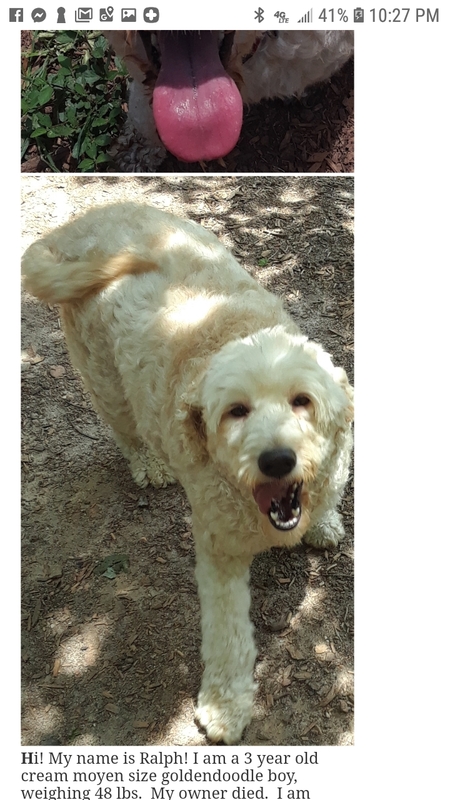 He is a moyen goldendoodle and weighs about 44 lbs. He is not anticipated to grow any more. He is neutered, heartworm tested negative, and updated on his vaccinations. He has a very happy, friendly disposition. 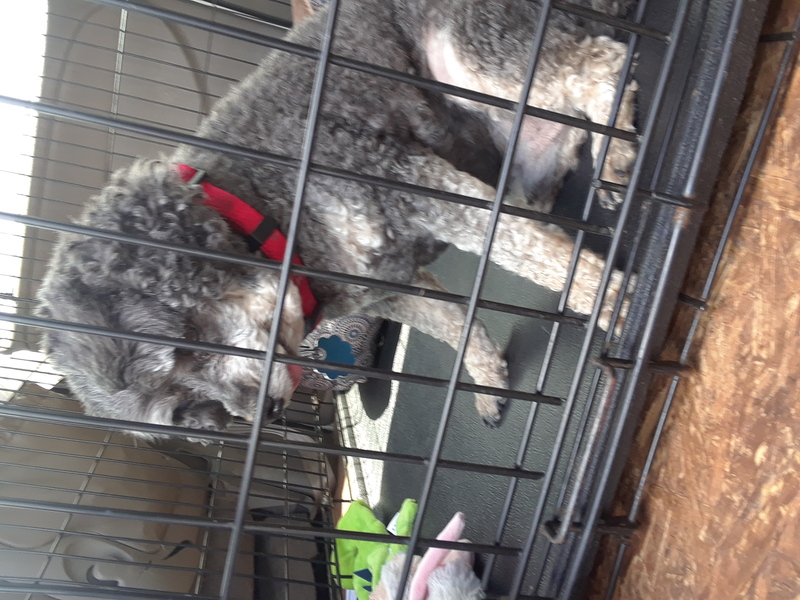 My name is Lucky and I am a beautiful silver toy poodle boy who is about 5-6 years old. My parents are deploying and cannot take me with them. 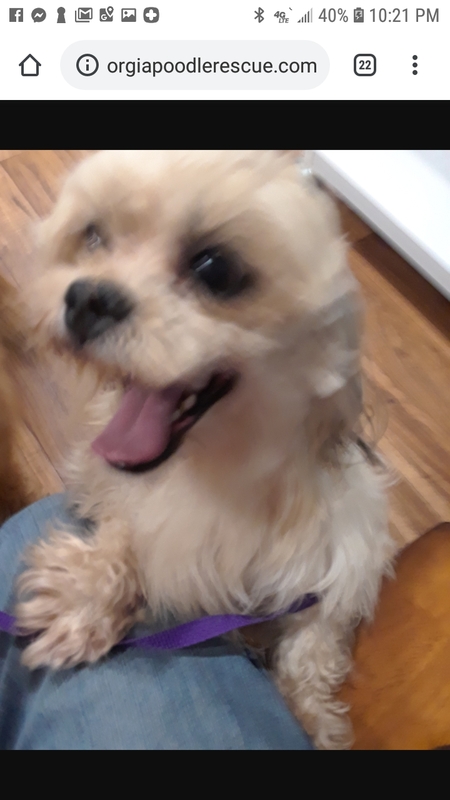 They had to choose between me and a yorkie sister going to my inlaws, so they asked Georgia Poodle Rescue to find me a good home. 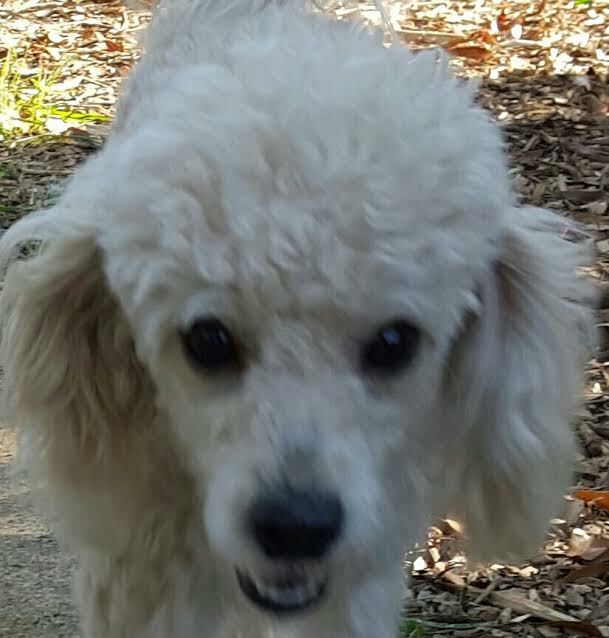 Georgia Poodle Rescue will have their vet neuter me and give me a dental. I am a cute and friendly little guy and like to sit on your lap and be with you and follow you around to see what you are doing. I weigh about 8 lbs but need to gain a few lbs. I tested heartworm positive. If you are interested in me then please view the policies and email for an application to meet me! ADOPTED!!! Snoopy – Petite Basset Griffon Vendeen! 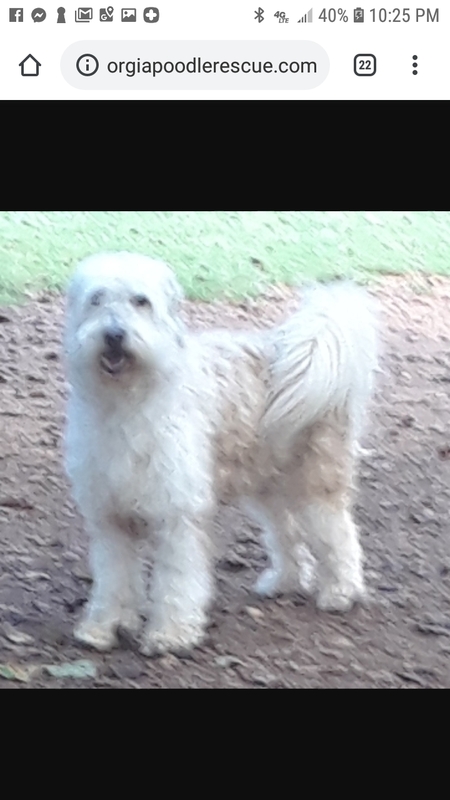 We believe Snoopy is a petite basset griffon vendeen purebred or mix. He is 13 months old as of February 2017 and was neutered on Valentines Day. A woman purchased him from an online ad but her dog did not get along with him. The original owners couldn’t keep him because they didn’t have enough time to train him. He has tested heartworm negative and is updated on his vaccines. He weighs about 20 lbs. He has a wonderful, happy personality. Is a bit shy at first but will warm up quickly especially if you have toys! He loves running and playing with our other dogs and loves to be cooed over. He needs a home with a fenced yard. ADOPTED!!! 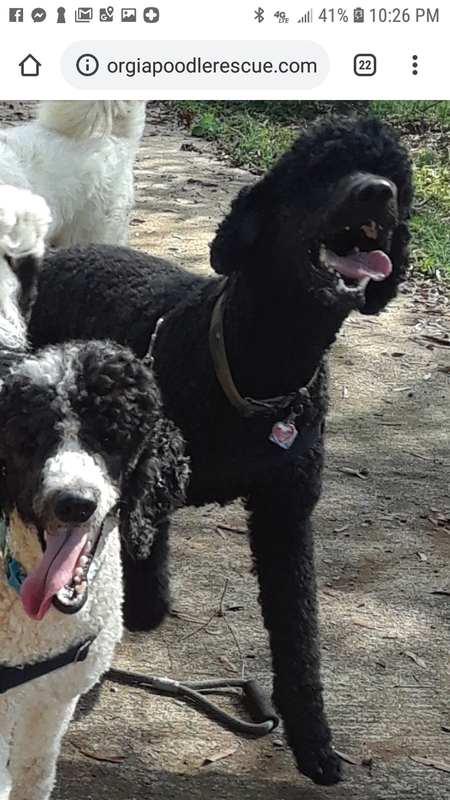 Sammy and Lilly – Black Boy and White Girl Toy Poodle Brother and Sister! ADOPTED!!! 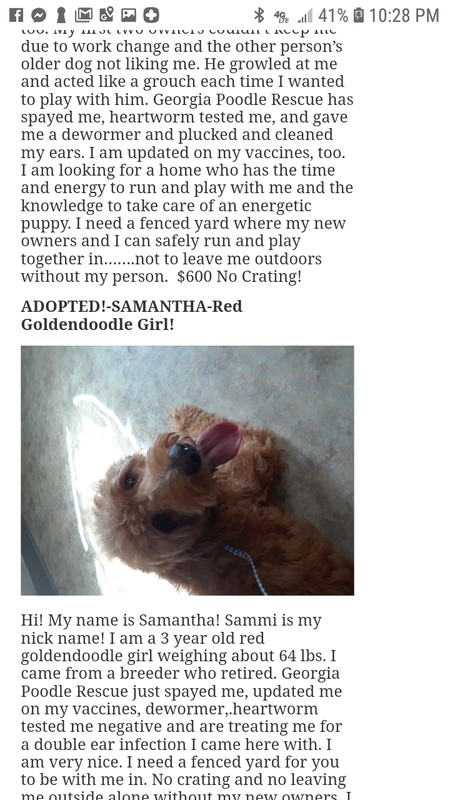 – ANGEL – CREAM GOLDENDOODLE GIRL! 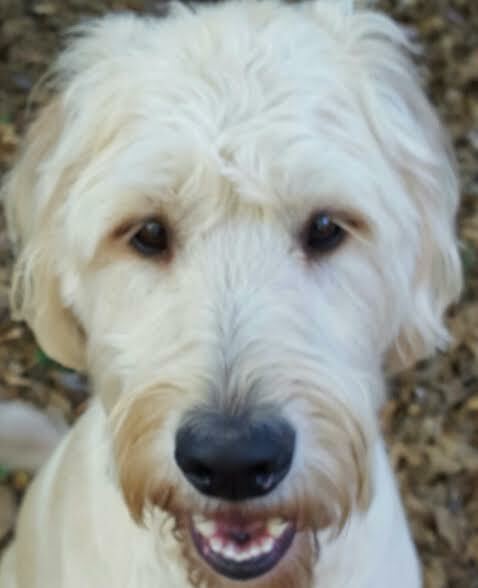 Angel is a 6 month old cream goldendoodle girl. She will grow to a full standard size dog. These pictures show Angel’s smile and being hugged and Angel in the van when we picked her up. We do not use crates at the rescue. We have spayed her and updated her on her vaccines and she has tested heartworm negative. She was purchased from a breeder by an older couple who lost their home. They gave her to a friend who lived in an apartment. As anyone knows big dogs, this did not work out as big dogs need to run off leash in a safely fenced area every single day with you running with them. She will be a full size standard goldendoodle. Very friendly. We are teaching her commands, socializing her, and working on potty training. She is doing very well. She has a long wavy coat. We are looking for a home with a fenced yard and appropriate dog ownership experience with this breed or similar breed and size. ADOPTED!!! – Stella – B/W Parti-Poodle Puppy Girl! Hi! My name is Stella! 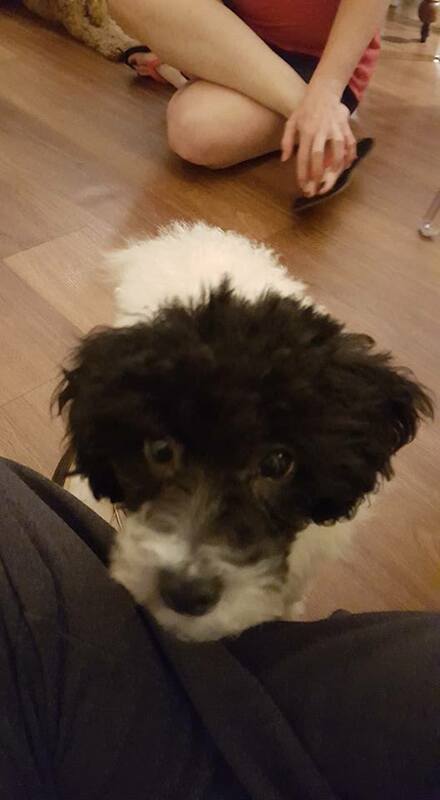 I am a black and white toy parti poodle puppy girl born 7/25/16, and weighing about 8.5 lbs November 2016. My mom loved me very much but forgot how much work a puppy is with needing tons of attention, potty training, and puppy training cuz I’m a puppy girl who likes to run and play and do all kinds of puppy things. I am very friendly and give kisses and can run and fetch a tennis ball and bring it back to you! I love all dogs I see and want to kiss them. I love you! I jump up and down like a pogo stick on my back legs when I want you to pick me up. I think I’m so cute……and you will too! 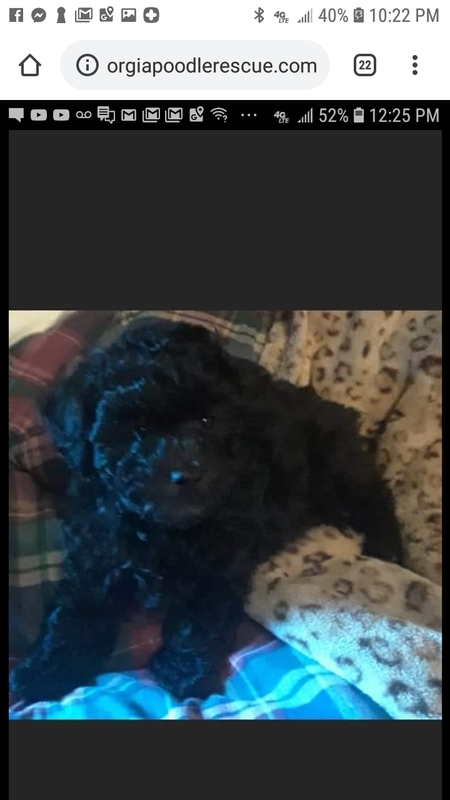 Georgia Poodle Rescue spayed me and updated me on my vaccines. I am looking for someone who is home a lot to play with me and teach me things because I need them at my age. I also need a home where the people can run and play with me and I won’t outlive them so I won’t need to be rescued again. Households must not have large dogs for the safety of Stella. 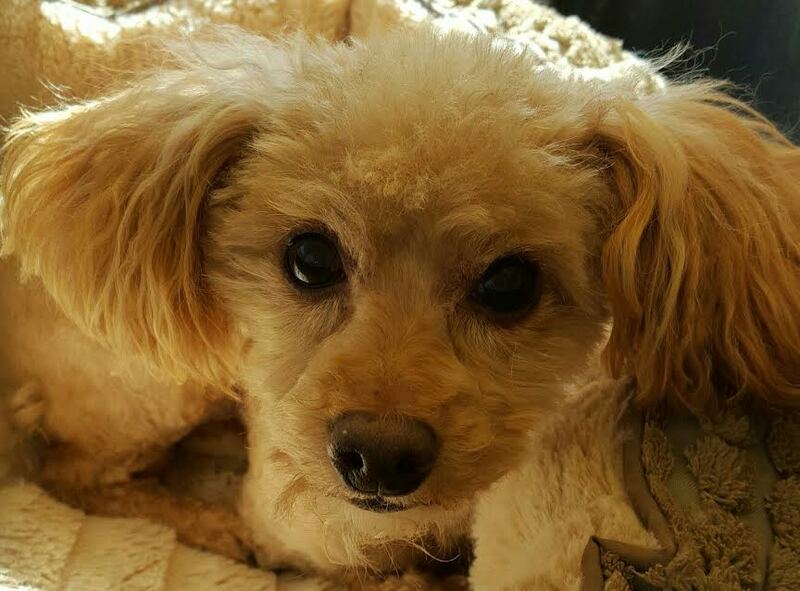 Zander is a 5 year old apricot toy poodle boy, weighing 8 lbs. 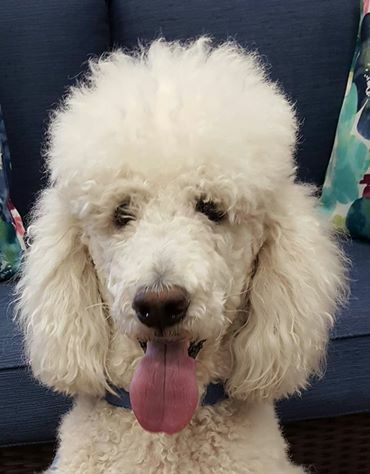 He belonged to an elderly woman who could no longer care for him so he went to two different family members who loved him but little Zander was too scared of their big dogs…..so he came to Georgia Poodle Rescue so we could find him a good home. 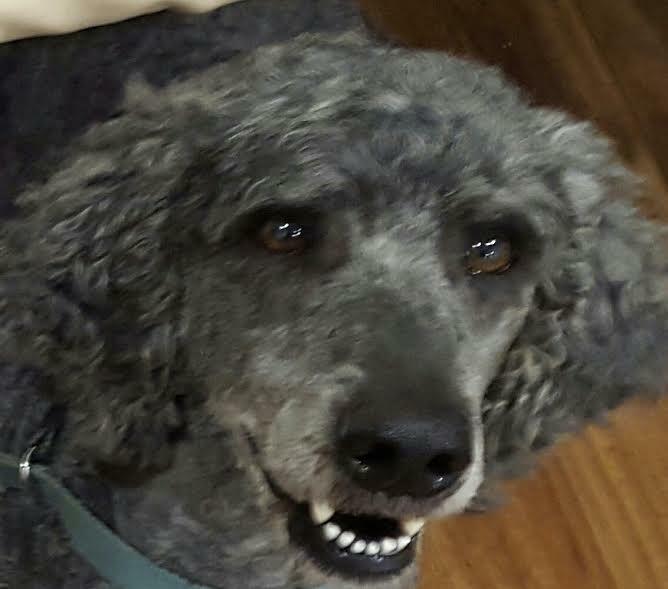 Georgia Poodle Rescue, had their vet neuter Zander, give him a dental, and update him on his vaccinations and he tested heartworm negative. Zander is a happy, quiet little guy. He gets along with all other dogs his size here and loves to be held and babied in your arms and would be perfectly content sitting on your lap while you work on your computer or watch TV. He loves to sleep in your arms. Here is a picture of him clipped short and with a full face of fur. Do you have room for a little Zander in your life? ADOPTED!!! – Major Star – Cafe au Lait Young Miniature Poodle Boy! Major Star is a beautiful cafe au lait young small miniature/large toy poodle boy who was born 6/15/15. We just had him neutered and updated his vaccines and he tested heartworm negative. He was originally purchased out of a box of puppies someone was selling in a parking lot. The person who purchased him, his second owner, had him for a few months then didn’t want to deal with a dog so she gave him to her sister, his third owner. She also had him for a few months and no longer wanted a dog so she dumped him at her mother’s home. The mother, who was the fourth owner had him for a few months where he stayed out on a deck during the day and brought in at night, could no longer keep him so she asked us to find him a good home…we are the fifth owner. We added Star to his name because he is a real star. He has a very nice personality, shy at first because he was so matted, he could hardly see. When we groomed him, we had to shave him down and the mat came off in one big pelt. He felt so relieved and was scared of the clippers at first but we spoke to him in a soothing voice and held him and he soon knew the clippers were his friend. He looked so relieved getting all that matted hair off of him. We are training him but he is available to be seen and possibly have the training continued by you with our tutelage. ADOPTED!!! 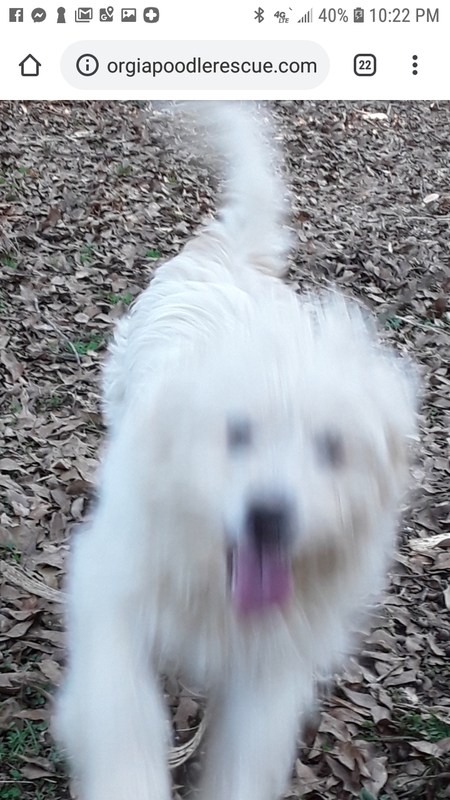 – Marilyn – White Maltese or Maltese Poodle Mix Girl ! 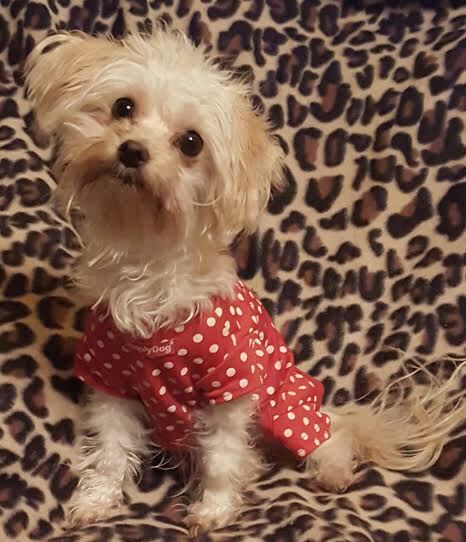 Marilyn Monroe is a 5.4 lb teacup toy female maltese. She was brought into animal control as a stray but the person could have been the owner! She was very matted looking like she had four ears and eight legs! We have groomed her into a very cute trim. Our evaluation shows that she was well loved, is lovable, is accustomed to living in a home but seemed to have never been groomed with all that matting and inch long toenails! We have an appointment with our vet to vet her and spay her is she needs to be spayed. We are thinking she probably does. She is very sweet and lovable and we are guessing her age to be 8 mos. to 2 years old. Our vet will tell us more on Tuesday, Feb. 7, 2017. 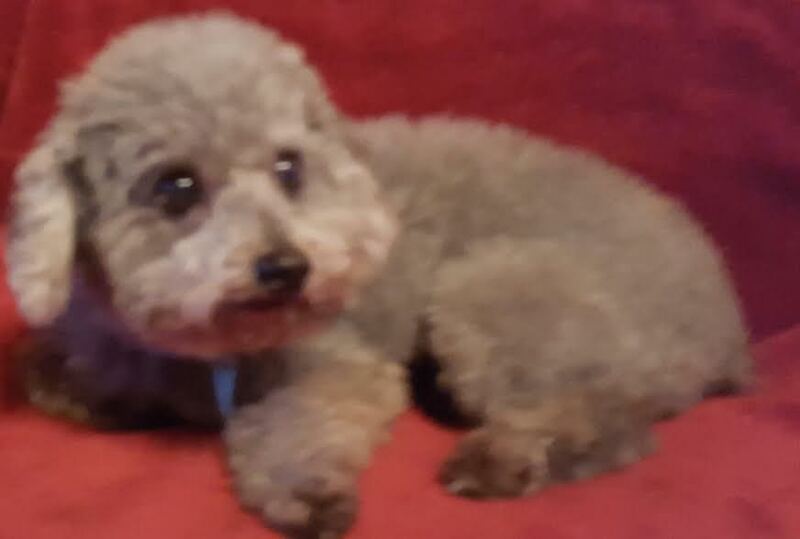 Missy, a blue toy poodle girl, born April 2010, came to us together with her sister Meg, who was adopted. 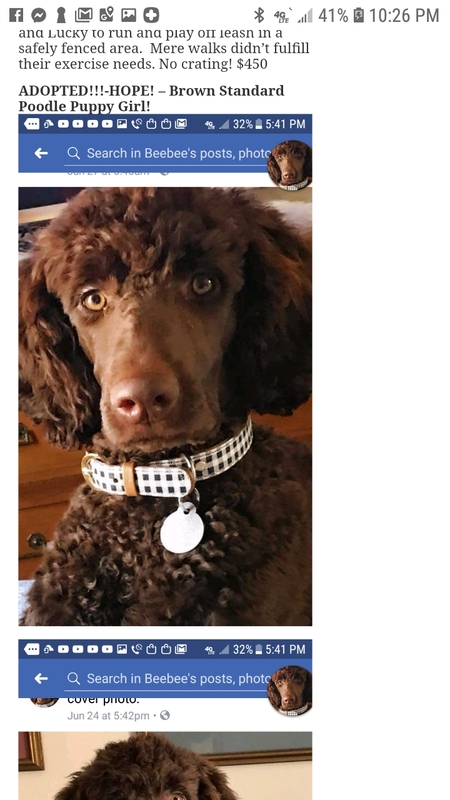 Their former owner’s new grandson, who spends a lot of time at their home, was diagnosed with a rare disease and the poodles made his allergies flare up, which caused dangerous breathing problems. 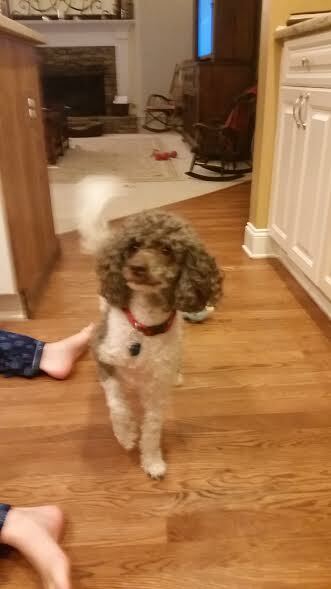 Both poodle girls were well cared for and we are now looking for a good home for Missy. Missy is a well behaved, friendly, and happy little girl who loves to cuddle with you. She is quiet and potty trained and will make someone a very happy owner! AMBER – Cream Toy Poodlex Girl! My name is Amber. 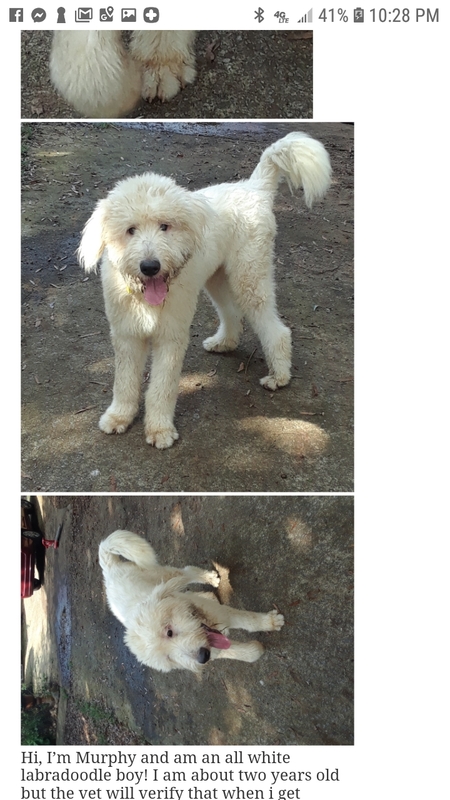 The first picture is how I look now and the second picture is how I looked when I first came to Georgia Poodle Rescue I am a tiny cream poodle mix girl, mostly poodle, possibly with maltese, with a disadvantage. I walk with my left front paw up as if I want you to shake paw with me. My former owners let me run free outdoors because “they were away from the road and “never had any problems” before”. Big dogs also running free attacked me and animal control was called. A high kill shelter with no vet put “me” behind bars because they couldn’t find the other dogs and because my owners now no longer wanted or cared for me. Maybe they wanted me to die. I am very lucky to be alive! 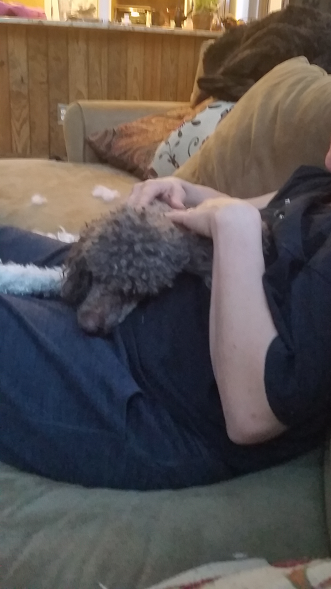 I am thankful I got out of animal control before I was automatically euthanized and a vet stitched me up and I came to Georgia Poodle Rescue. My stitches have just been removed but I have radial nerve damage to my front left paw. I don’t place weight on it when I walk but can walk and run and hop on and off furniture fine. I was untrusting when I first came here and was in pain but have turned into a well behaved, wonderful, and happy little girl who gets along with other dogs. I like to cuddle and can hug you, too, and hang out and keep people company and follow you around both inside and out. I like other friendly small dogs. I can run fast and jump on and off furniture. 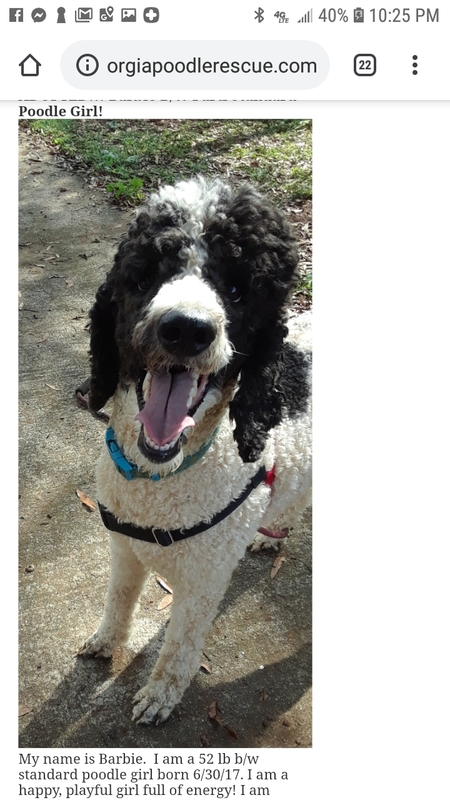 I am updated on my vaccines, have tested heartworm negative, am microchipped and only need to be spayed, which Georgia Poodle Rescue will do…but you can come and see me now! Please read policies at the end of this page and email georgiapoodlerescue@gmail.com for an application for a meet and greet. Please let me live in a loving home again….One that won’t get rid of me. I promise my disability is minor and we can play, and cuddle, and love each other. Love, Amber. ADOPTED-!! 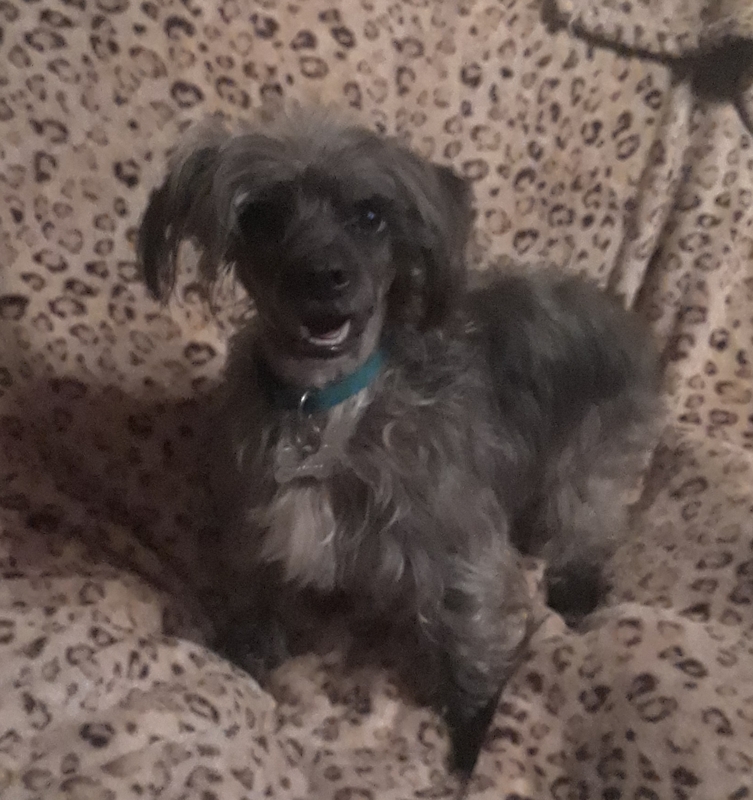 !ITA – Toy Gray/Silver Poodle/Silkie or Cairn Mix Girl! ADOPTED!!! 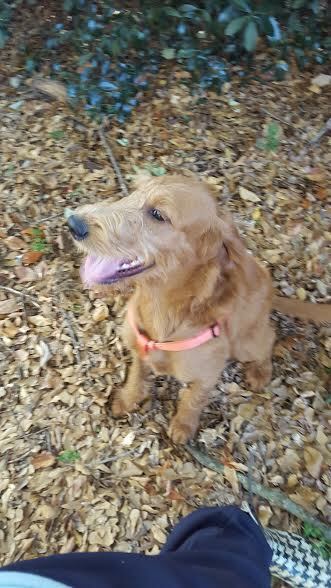 MOLLY – RED GOLDENDOODLE PUPPY GIRL! 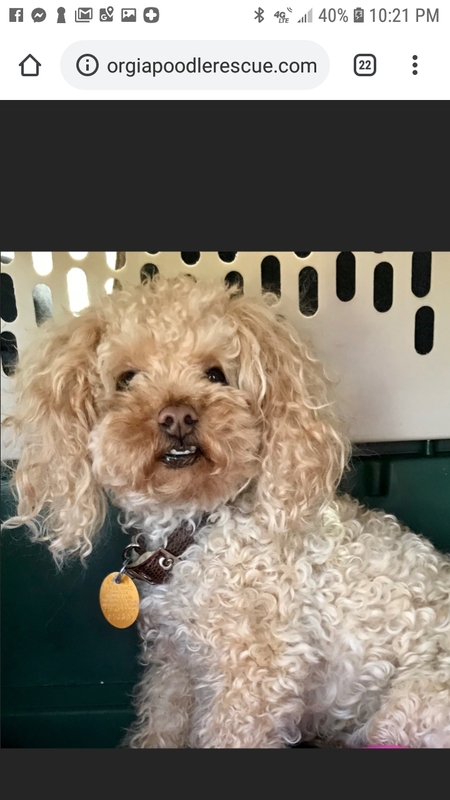 Bijou is a two year old toy poodle or poodlex boy, who is cream colored and weighs about 12 lbs. His owner is not able to take him with her in the home she is going to. Bijou is a friendly little guy. He gets along with other dogs and loves attention from people. He knows commands and loves playing with toys and a comfy bed. We are giving him pack leadership training and he is available to be adopted. Our vet has just given him a three-year rabies vaccine, he is heartworm negative, and updated on his vaccines. ADOPTED!!! 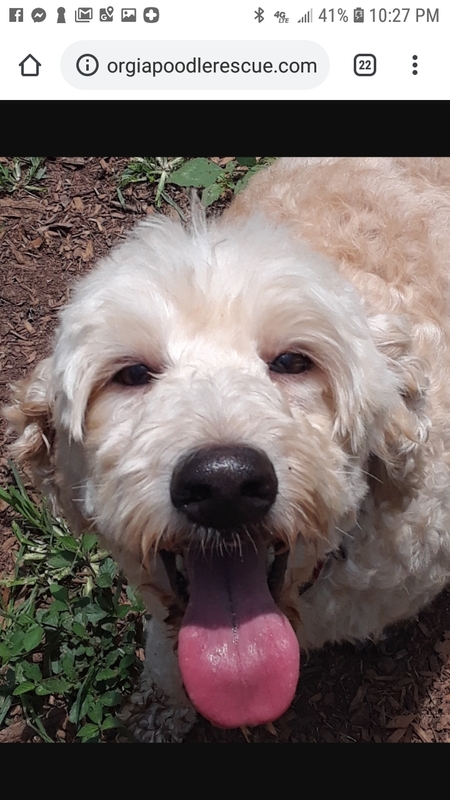 JACK – CREAM LABRADOODLE BOY! 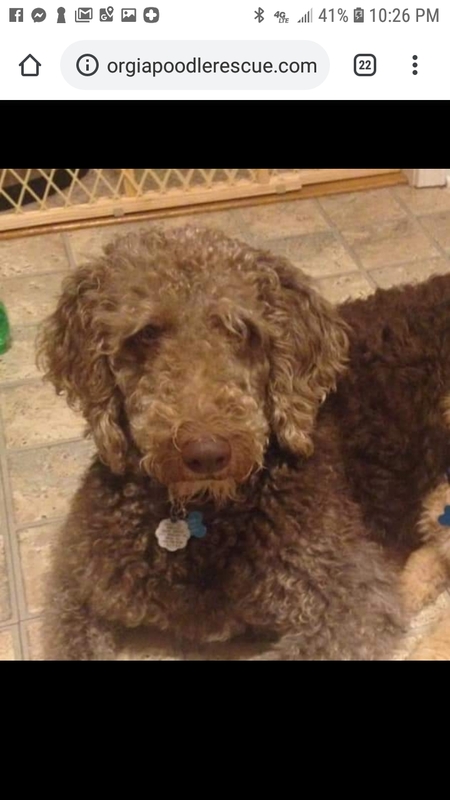 Jack is a cream labradoodle boy born 11/8/14, who just turned two years old! He weighs 80 lbs and is a happy, gentle boy, who loves playing with older children. His family could not keep him because they were allergic to him. 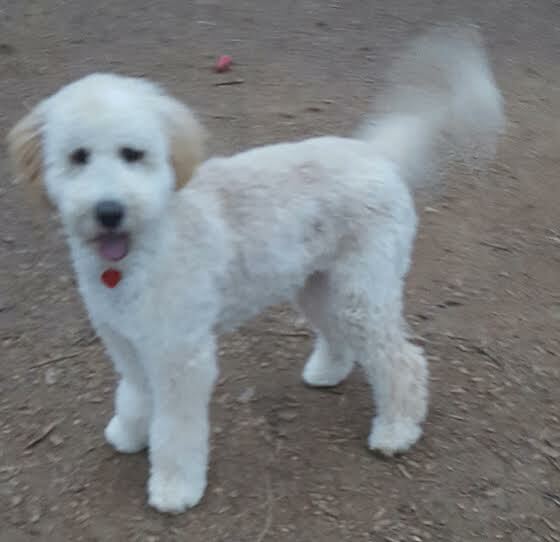 Jack has the longer wavy and fluffy doodle hair and his body was clipped short when he came to us but we were told the hair on his body matches the hair on his head. Jack loves playing with balls and toys and with other dogs and people. 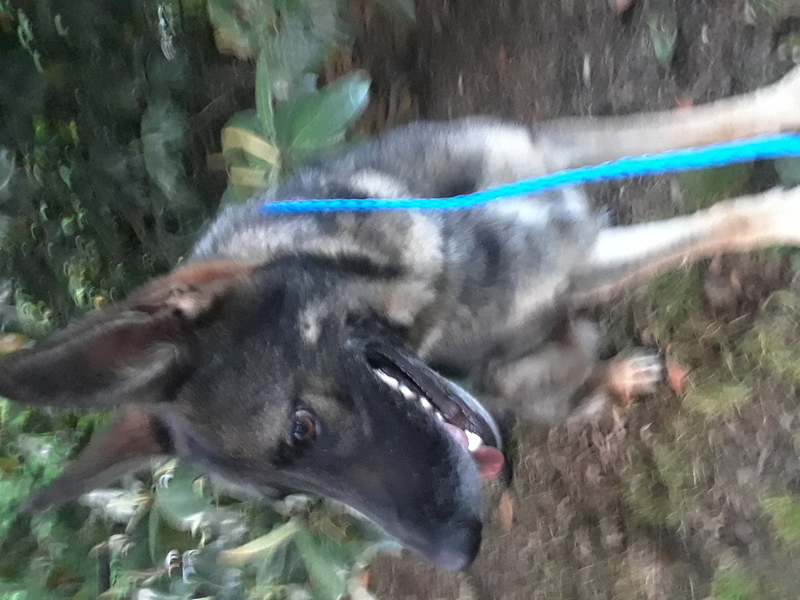 He is a friendly guy and we are looking for someone who has a sturdy, safely fenced yard where they can go outside and play safely with Jack in. ADOPTED!!! – DEJAVU – YOUNG WHITE POODLE GIRL! 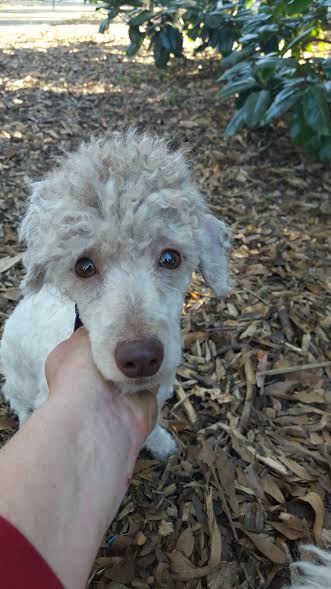 Dejavu is a charming white toy poodle girl who is estimated to be between 1 and 1.5 years old. 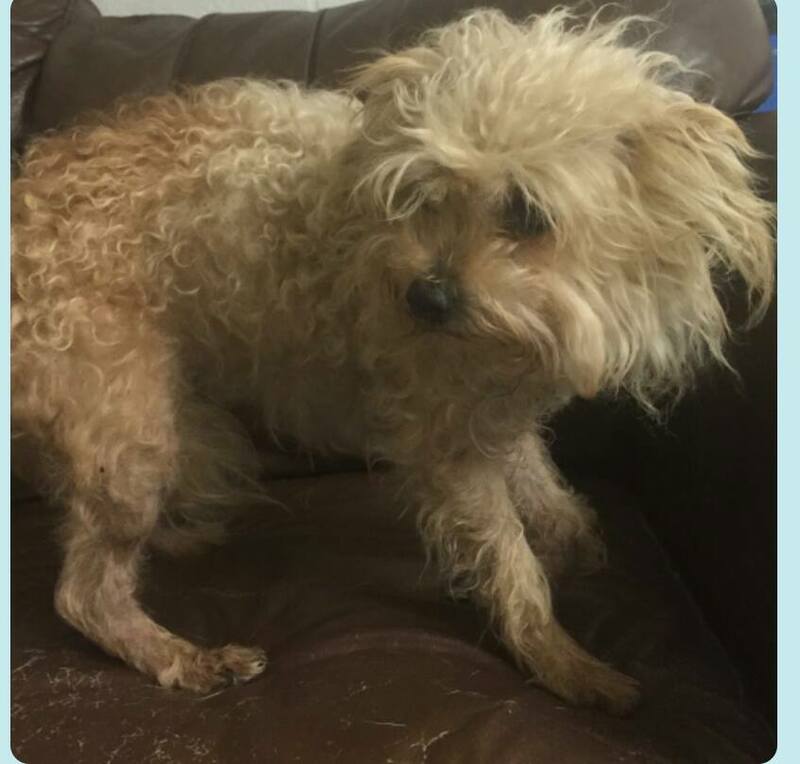 She was from a south GA animal control facility very matted and two volunteers drove over 4 hours to get her to us. She cleaned up very nicely, tested negative for heartworms and received her vaccinations. Dejavu loves to stand on her hind legs and place her front paws together and wave them up and down while smiling. She is a real cutie pie who loves other dogs, people, and life! PENDING ADOPTION!!! – AMBER – Cream Toy Poodlex Girl! 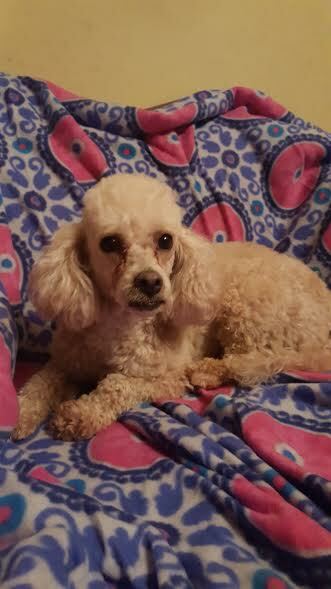 Dejavu is a charming white toy poodle girl who is estimated to be between 1 and 1.5 years old. 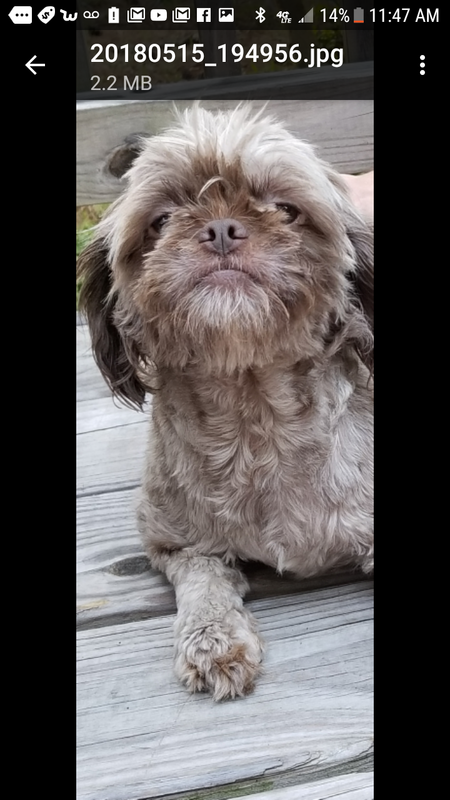 She was from a south GA animal control facility very matted and two volunteers drove over 4 hours to get her to us. She cleaned up very nicely, tested negative for heartworms and received her vaccinations. Dejavu loves to stand on her hind legs and place her front paws together and wave them up and down while smiling. 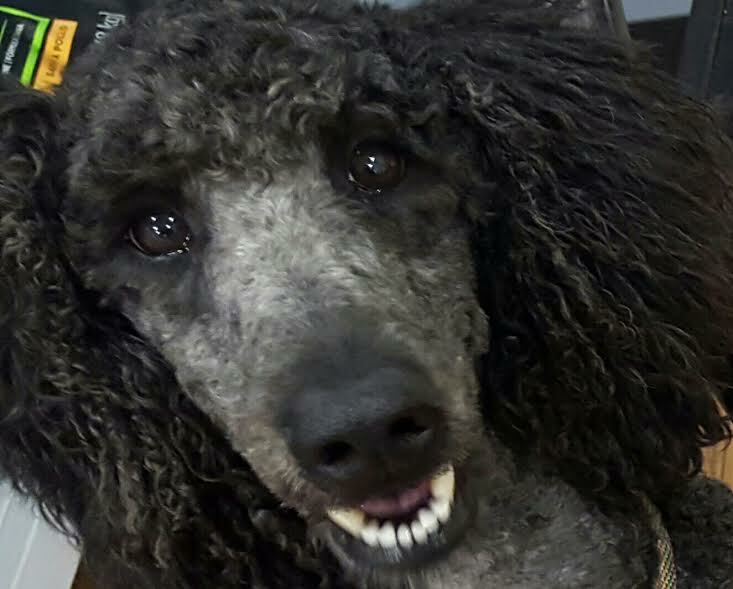 She is a real cutie pie who loves other dogs, people, and life!Poodlex Girl! ADOPTED!!! 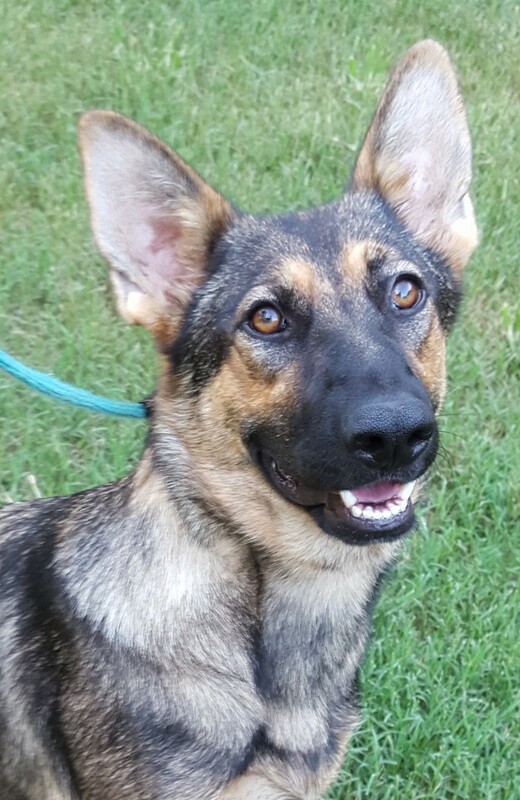 RUBY SLIPPERS – Black and Tan Young German Shepherd Girl!! !